In post 3/3 of my series on unusual connections, I want to broaden the scope my argument beyond simply river floods and shipworms. Disasters in the Dutch 18th century were all connected! In a sense, this is the principal argument of my manuscript. The eighteenth century was (relatively) disastrous for the Dutch Republic. (1) After enjoying a century of prosperity, the Golden Age of Dutch economic success, artistic efflorescence, and political influence had begun to wane by the eighteenth century. Disasters reflected new anxieties about this change of circumstances just as they contributed to increasing financial pressures. In this perfect storm of cultural, economic, and environmental uncertainty, contemporaries linked disasters together. Naturally, causal connections were stronger in some situations than others. Adverse weather, particularly harsh winters like 1740-1741, created numerous rippling effects and directly or indirectly contributed to several other demographic and environmental disasters. 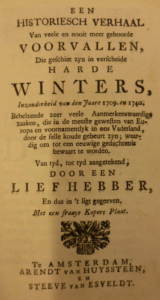 In addition to the direct consequences of frigid conditions (reports of cattle and sometimes even people dying from exposure abound), historians have indirectly connected adverse weather to a widespread mortality wave in the Netherlands and across Europe via failed harvests. (4) Furthermore, frigid conditions prompted the formation of ice dams on Dutch waterways. One can even connect these stressful environmental conditions to cattle plagues. Lack of fodder and prolonged exposure to adverse conditions likely weakened the immune systems of cattle making them more susceptible to disease. Rivers, on the other hand, had very little direct causal connection to the shipworm epidemic outside of the circumstances mentioned in these post. Independently of direct environmental causation, however, contemporaries discursively linked the disasters of the 18th century. Rural communities merged disasters together in their petitions for remission from provincial taxation. 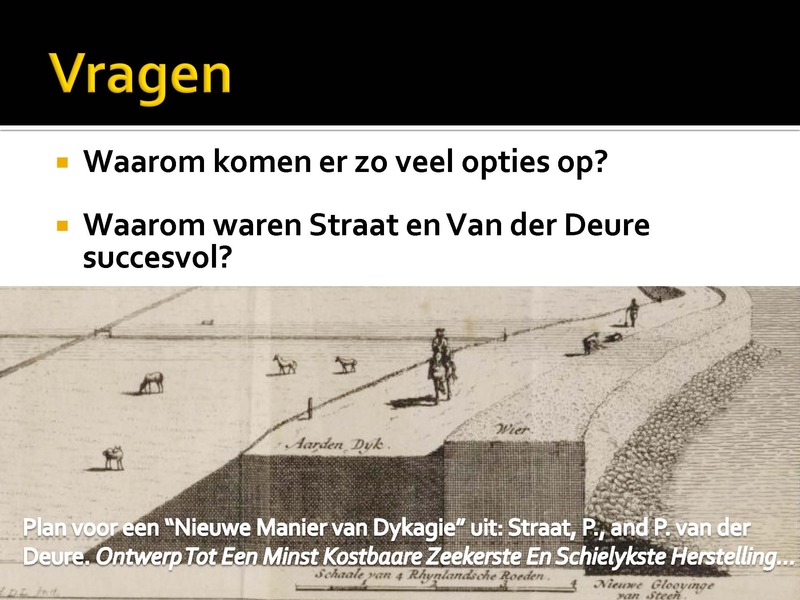 The burden of rebuilding dikes in the wake of river floods (or shipworms) combined with the need to replenish cattle stocks after cattle plague epidemics) while also shouldering their usual tax burden, residents argued, was untenable. The most common discursive linkages were providential. Disasters pointed to God’s wrath and confirmed the sinful state of the Dutch Republic. Clergy and laypeople discursively connected disasters in order to build a case for providential causation. Each successive disaster was further proof of this “sin economy.” Causal stories grounded in divine providence were far from uniform and they could be tailored to suit any numbers of agendas. Providential readings of disasters could challenge or support political ideologies, promote or discourage technological adaptation, or inspire emotional connection to disasters victims. (5) Regardless, repeated disasters like that of the shipworms epidemic and the mid-century river floodings strengthened these interpretations. Finally, water authorities likewise created discursive connections between disastrous events, in particular river flooding and coastal flooding. This was very apparent in the 1730s during the shipworm epidemic and in the wake of disastrous river floods along the Rhine in 1726 and 1740-41. By the 1740s, paranoia about the breaking of the northern Lekdijk had become fever pitch. (6) The 1740-41 floods were not incredibly deadly but they were extensive. By the 1750s, it seemed almost a miracle that the northern Lekdijk, which protected much of the Green Heart of Holland, had not yet broken. Water authorities like Velsen were deeply cognizant of the vulnerability of the economic center of the country to flooding if the northern dike along the Lek fell. If that were to happen, the entire area between the river lands and the river IJ near Amsterdam could be inundated. At the same time, flood vulnerability was becoming an object of increasing concern in northern Holland. By 1733, West Frisian water boards had shifted the discourse surrounding shipworms from a novel biological disaster (for which there was still no adequate response) to the more manageable threat of coastal flooding. If the West Frisian sea dikes failed, the water boards argued, the “fortress” of northern Holland (in particular the “Westfries Omringdijk) from West Friesland south to the IJ could be turned into a “bare sea.” The vulnerability discourses of North and South Holland were complimentary and even shared the same language. Should these disasters occur simultaneously, Holland would face an existential threat. Both Velsen and the designers of the new shipworm-proof sea dikes of West Friesland harnessed this discourse to their advantage, though Velsen would enjoy far less success in realizing his proposals. Although the shipworm epidemic of the 1730s and the river flooding between 1726 and the 1750s seem to have little in common, closer inspection reveals numerous connections. In this series of posts, I’ve highlighted three connections, but this only scratches the surface of possible relationships. Governing governing bodies sometimes used disasters management efforts as political tools to further their own, more local interests. For instance, several cities along the Meuse river blocked a subsidy for the repair of West-Frisian sea dikes during the shipworms epidemic in 1735 in order to push through their goals. One of the consequences of the increasing consolidation of water management under the provinces was that the disaster management needs of one region could become beholden to those of another. It should perhaps come as no surprise that disasters beget other disasters. Scholars often focus on direct causal relationships stemming from persistent social or economic disadvantage, environmental (oftentimes climatic) influence, or poor management of infrastructure to explain these relationships. These connections were likewise influential in the early modern Dutch Republic. The increasing consolidation and integration of large scale water management in Holland as well as the province’s growing reliance upon “expert” advice in the eighteenth century ensured financial and technological relationships between seemingly disconnected disasters. At the same time, contemporaries crafted discursive relationships between disasters separated by years (even decades) in their ambition to create disaster mitigation strategies and to lessen the financial burden of the events. Providential interpretations used a similar strategy in order to promote moral interpretations and responses to these periods of disaster. “Unlikely connections” were not limited to the relationships between shipworms and river floods either. One could just as easily tally off similar connections between shipworms and coastal flooding or cattle plagues. The nature of disaster interpretation and management in the Dutch eighteenth century would seem to have facilitated many of these relationships. A compelling argument might also be made, however, that this was not a condition of pre-modern disasters. Disasters are still frequently linked together, causally, institutionally, and discursively. Scholars should certainly not abandon seeking environmental or social relationships between disasters, especially in the early modern period, but many other types of connections (cultural, moral, technological, political) abound as well. (2) Indeed, there is little reason to believe that river floods or storm surges increased in number over the course of the 18th century, though there is some indication that they increased in severity. The shipworm epidemic and cattle plagues were exceptions in that they certainly increased in severity and number. (5) Marijke Meijer Dress, “’Providential discourse reconsidered: the case of the Delft Thunderclap’,” Dutch Crossing: Journal of Low Countries Studies 2 (2016):108-121. 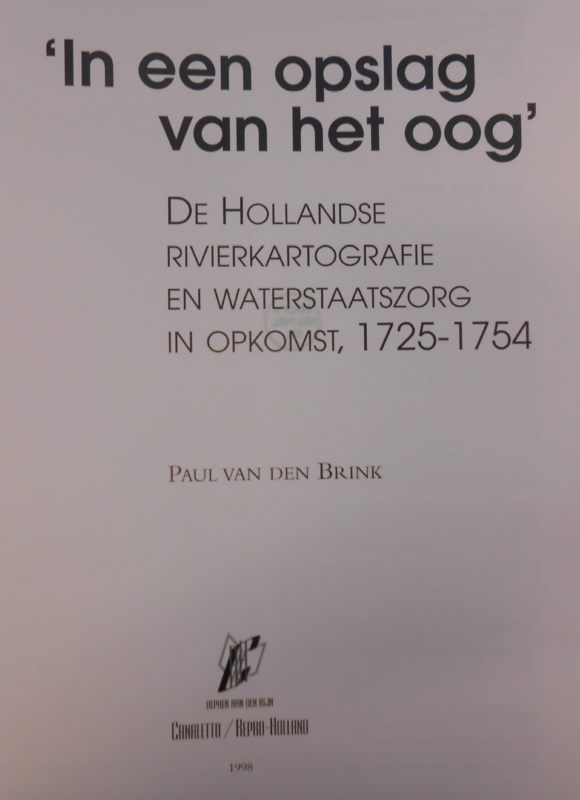 (6) Paul van den Brink, “Rijnland en de rivieren: Inrichting en vormgeving van de Hollandse rivierzorg in de achttiende eeuw,” Tijdschrift voor Waterstaatsgeschienis 12 (2003). 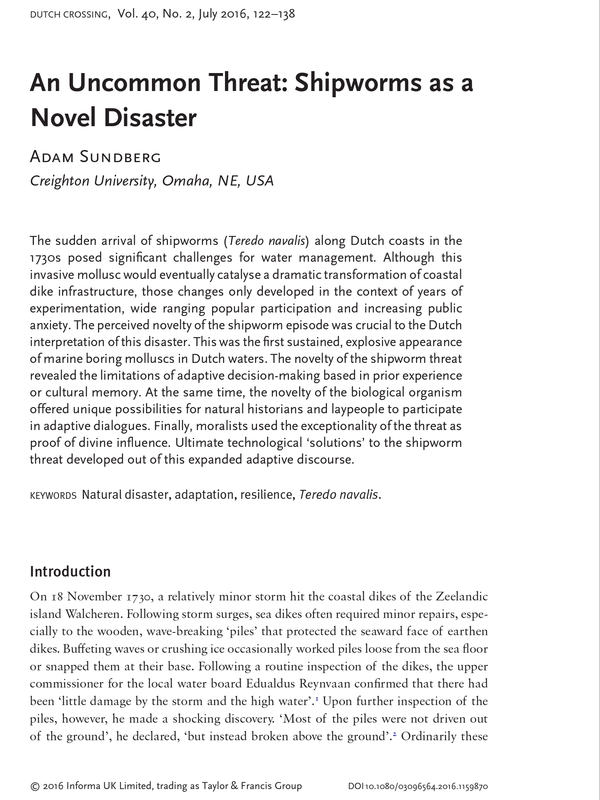 (7) Adam Sundberg, “An Uncommon Threat: Shipworms as a Novel Disaster,” Dutch Crossing: Journal of Low Countries Studies 2 (2016). This entry was posted in Research on July 17, 2016 by ads135. 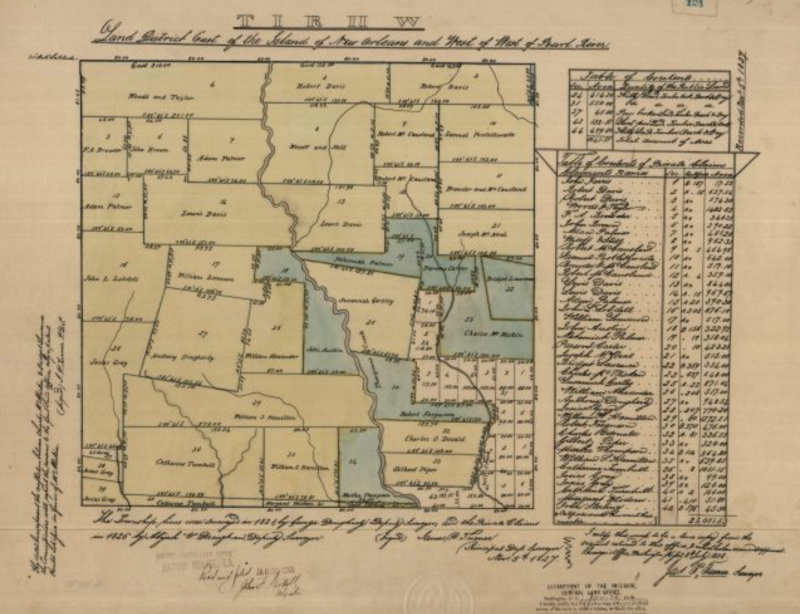 For some time, I’ve been trying to find good workarounds to host and display geotiffs of historical maps. There are a number of options available, from Neatline/Omeka to Google Earth, to Maptiler/google hosting, to arcgis online. Unfortunately, most have significant disadvantages. Google Earth will display the geotiff as a background, but there is limited interactivity with vector data. Maptiler requires a paid account to remove its watermark and the google hosting option will likely disappear as an option this year. ArcGIS online requires access to an arc server. Depending on the size of the project, Neatline/Omeka is a good option if you have the space to host it on your own server, but its installation is not particularly user-friendly. 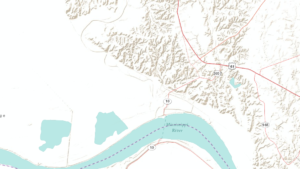 The most intuitive option I’ve found thus far has been Mapbox. An online map styling platform that offers a GB of hosting space for free accounts, Mapbox provides a user-friendly GUI (much improved from the TillMill/Maptiler classic, though with more limited raster manipulation options) and easy integration of your Geotiff basemaps with ArcGIS Online, CartoDB, Leaflet, or simply hosting static images on your own website. Naturally, I’m sure there are a number of additional options and I’m very interested to hear suggestions and/or see examples using different methods/platforms. Below, I’ve attached two options using a small dataset that visualizes dike breaches throughout the Rijn/Maas river region of the Netherlands during the catastrophic floodings between Dec 1740 and Jan 1741. The first is an animated “torque” map that highlights the location and timing of dike breaches. The second in Arc Online is an interactive, albeit static map that features additional information about the dike breaches (location, time of day, source of information, and the regions the breach threatened). One issue I’ve noticed with this hosting option is that higher zoom levels distort the historic basemap. As you zoom in, the basemap resolves more clearly. I have yet to find a work around for this issue. This entry was posted in DH Explorations on July 17, 2016 by ads135. In the second installment of a three part series on the improbably connections between shipworms and river flooding in the eighteenth century, I want to focus on the subject of “expertise” in water management. Despite the fact that coastal floods and river floods are fundamentally different and despite (or because…) shipworms were an unknown factor in both, the Estates of Holland drew on the same experts for both sets of problems. “Expertise” in water management was relatively fluid in the Dutch eighteenth century. The organizations that typically managed water defenses were waterboards. These administrative bodies were separate from provincial governments, but by the early eighteenth century both provinces and the water boards drew on the upper echelons of society for their leadership. They also both employed experienced landmeters (surveyors) and cartographers to chart their territories and offer “expert” advice. Nicolaas Cruquius (introduced in post 1/3) was one such surveyor, as was Cornelis Velsen, the former surveyor of the oldest waterschap in the Netherlands, the Hoogheemraadschap Rijnland in southern Holland. Velsen was arguably the most influential figure in Holland’s mid-eighteenth century management. Son of the landmeter of Rijnland and himself a deputy, Velsen was well situated to assume the same role. Like Cruquius, Velsen received practical training working for the water boards before enrolling in the “Duytse Mathematique” (meaning, it was in the colloquial Dutch, rather than Latin) at Leiden University. Also like Cruquius (one could argue because of Cruquius) Velsen firmly advocated an empirical approach to river management. Rivers could only be tamed and controlled, they maintained, if they were carefully studied, measured, and mapped. In 1731, Velsen abandoned his position in Rijnland and assuming the position of clerk to the secretary of Holland. This was precisely the moment that the province faced new, unexpected challenges. Provincial governments did not traditionally manage water-related issues in the Netherlands, but instead left those tasks to regional and local water boards. Disasters like river floods and the shipworm epidemic, however, were large in scope and devastatingly expense. They were far too expensive for single water boards to manage effectively. (1) When Velsen began his tenure in Holland, he had far more resources at his disposal than any single water board. Even the richest province in the Netherlands (Rijnland) had difficulty managing the disasters laid out before it. Between 1700 and 1750, the Dutch river lands experienced seemingly unremitting high water, dike breaches, and even flooding. (2) On top of that, beginning in 1731, dike inspections found shipworms in the piles protecting much of Holland’s coast, from Goeree in the south to the north tip of Holland on the barrier island Texel. Both Cruquius and Velsen were called upon for expert advice in both situations. In the river lands following the disastrous floods of 1726 along the Meuse and Waal, the Estates of Holland commissioned Cruquius to again produce a map. The final product was a “cartographic masterpiece.” (3) The map employed several innovations (including the use of bathymetric isolines). Velsen would become an even greater player in the management of the Rhine and Meuse branches after successive major river floods in 1740 and 1741. His publication of Rivierkundige Verhandelining in 1749 occurred at precisely the right moment with high waters threatened to break through the Lekdijk. In the context of the shipworm epidemic, both Cruquius and Velsen offered expert advice to the province as well. Cruquius’ advice supported that of Jacob van der Dussen, the dike reeve of Amstelland, to completely remake the pile dike that protected the coast near Muiden. (4) This design, which removed the wooden element from the water, replacing them with a gently sloping earthen embankment, was the progenitor of modern coastal dikes. Velsen’s advice saw far less success, but his role was nevertheless important. Velsen represented the interests of the Estates of Holland, however, the province found themselves at odds with the combined power of the West Frisian waterboards. Velsen and the special provincial commission he headed advocated a solution that removed the wooden framework that typically held a seaweed “cushion” (wineriem) in front of the earthen dike. Instead, wooden piles were driven perpendicularly through the seaweed cushion to fasten it to the base of the dike. The commission funded this plan and quickly exacted it. By 1733, however, observers quickly realized how vulnerable this plan was to the relentless beating of Zuiderzee waves. Ultimately, the West Frisian waterboards opted for a solution similar to Van der Dussen’s, replacing wierdijken with more gently sloping dikes, covered with imported stone. Although Velsen’s advice was ultimately rejected, his (and Cruquius’) participation in the dialogue represented an increasing dependency on “expert” advice on the part of provincial water management and a further connections between river and coastal protection. (1) Due to the increasing cost and complexity of water-related problems, by the eighteenth century, provinces had assumed ever-increasing roles in the management and funding of large scale projects – particularly those that crossed provincial borders. Rivers were the prototypical interprovincial issue. The Rhine and Meuse rivers affected every province south of the Zuiderzee. It is somewhat surprising, therefore, that interprovincial management of rivers was still only nascent in the early 18th century. (2) These included dike breaches in 1709, 1711, 1726, 1740, and 1741, not to mention nearly annual high water or even flooding without dike breaches. (4) C. Baars, “Herstel van de paalwormschade aan de Zuiderzeedijken beoosten Muiden,” Waterschapsbelgangen 74 (1989), 437-8. This entry was posted in Research on July 9, 2016 by ads135. Shipworms and river flooding should not have much in common. The wood boring mussel Teredo navalis, which exploded in numbers in the wooden barriers protected Dutch sea dikes in the 1730s, was a coastal, not a riverine threat. The shipworm epidemic had a significant (even transformative) impact on coastal dikes, but they had no direct impact on river dikes. Shipworms are marine species whose tolerance for freshwater normally extends only as low as 7 PSU. Shipworms, in other words, can live in brackish water (including the Rhine/Meuse estuary), but cannot approach the rivers themselves. A shipworm attack on a river dike would be impossible. What relationships could these seemingly disconnected disasters share? my thinking about the relationship between these disasters and in the process, I will make a case that environmental historians and historians of disasters should go beyond direct causal connections (particularly from environmental or social vulnerabilities) and explore indirect connections stemming from cultural, political, and technological relationships. The Dutch Republic between 1650-1750 offers a compelling case in point. I stumbled upon the first connection while reading up on river cartography in the first half of the eighteenth century. I have been transitioning my research focus from shipworms to Dutch river floods over the last month and maps seemed as good a place as any to start. Since I am a relative newcomer to the history of river flooding, much of my time has been spent boning up on the subject. (One might assume that knowledge of coastal and river flooding are interchangeable, but in reality they operate according to very different principles). 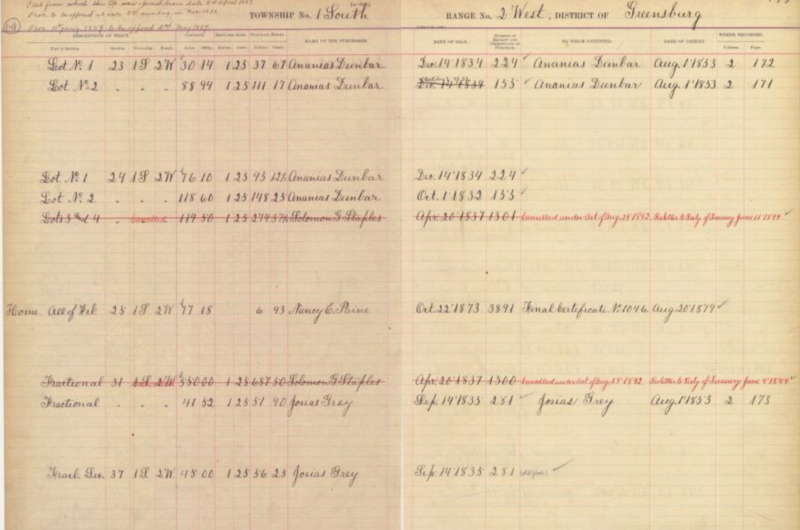 Surprisingly, it was this background reading, rather than some key archival find, which provided the first connection. 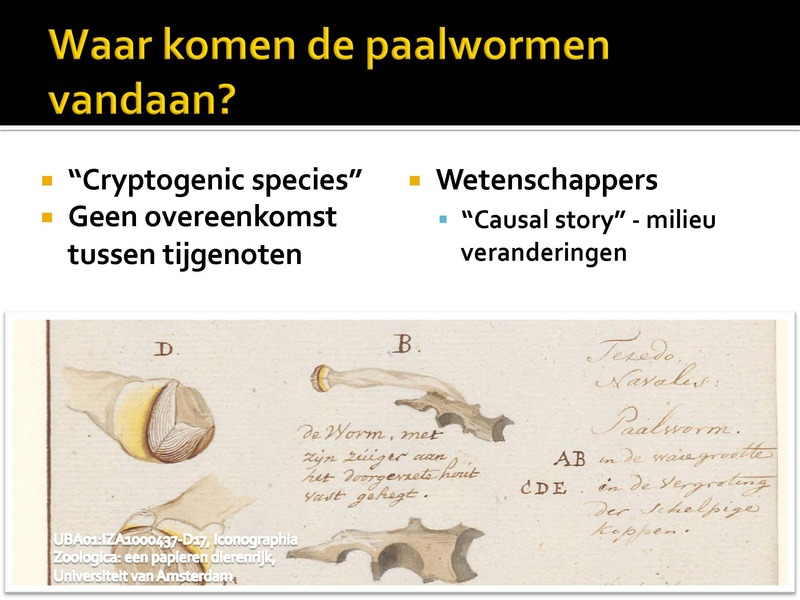 Okay, perhaps that’s overstating things, but shipworms may have nevertheless been a key factor that prompted the rise to significance of perhaps one of the most significant scientists surveyors of the Dutch eighteenth century. By the 1720s, Nicolaas Kruik (1678-1754) was already a well-respected surveyor and cartographer who, along with his brother Jacob, produced a large format, highly detailed map of the Delfland waterboard for the Hoogheemraadschap Delfland in 1712. Later, Cruquius would move to Leiden where he would study under the famous Dutch natural philosopher Willem Jacob s’ Gravesande, the Italian natural scientist Luigi Ferdinando Marsigli, and the Dutch physician Herman Boerhaave. 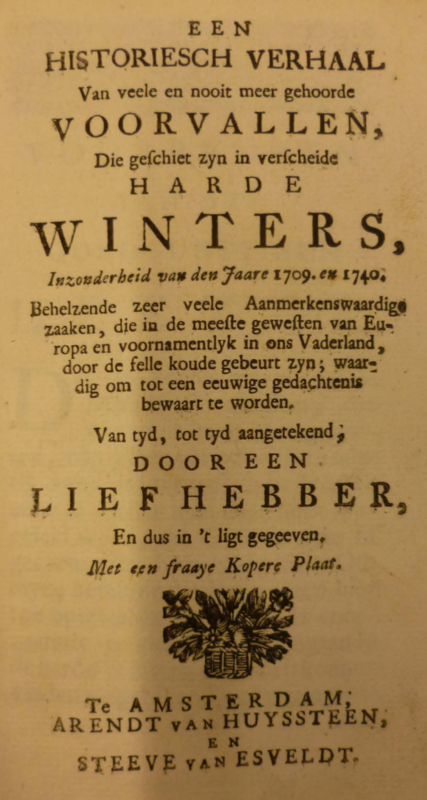 He would also keep one of the earliest series of weather observations in the Netherlands, a set of empirical data still used by KNMI (Dutch Meteorological Institute). It was due to his early success and his standing as both an experienced surveyor and trained scholar that he was employed by a special commission of the Estates of Holland to begin a new empirical study of the coast of the island Goeree in the late 1720s. Goeree was one of the southernmost islands of Holland, nestled between the Holland island Voorne and the Zeelandic island Schouwen, though today it (and many other Holland and Zeeland islands in the delta) is connected into peninsulas or “super islands” like Goeree-Overflakkee. The island Goeree was important in the early 18th century because it was eroding. The Estates of Holland had been closely monitoring the impact of this erosion since 1715. (2) Sediment from the coast of Goeree (or “Goederede” as it was known then) threatened ship traffic when it drifted toward the North Sea along the Haringvliet into the Hellevoetsluis harbor. Hellevoetsluis was one of the principal ports of the admiralty of Rotterdam, thus the concern. To prevent erosion, Holland developed an elaborate network of “hoofden” and “rijswerken” (groynes). Unfortunately, by the late 1720s, this type of construction was vulnerable to an increasingly problematic new threat: the shipworm. Cruquius’ talents were necessary to come up with a new solution. Eventually, Cruiquius would produce an incredibly detailed map of the island of Goeree in an effort to convince the Estates of Holland of his plan to lay a dam along sand banks in the direction of the neighboring island Overflakkee. 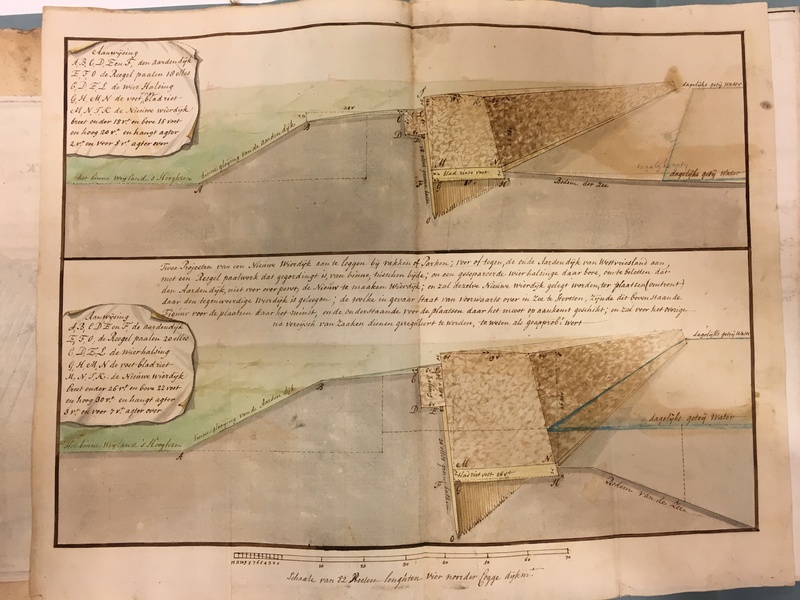 Although his plan was never realized, his fantastic map, according Paul van der Brink in his work In een Opslag van het Oog: De Hollandse Rivierkartografie en Waterstaatzorg in Opkomst, 1725-54 (At the Glance of the Eye: The Rise of Holland River Cartogarphy and Flood Prevention, 1725-54) represented the beginning of a new age of Dutch cartography, one governed by scientific methodologies. The only problem is, where are the worms? It is very difficult moving through Van der Brinks notes since the archive they are housed in has since moved. Furthermore, the “minuut-resoluties” of the Estates of Holland at the National Archives that possibly contain information on shipworms have no index and after hours of searching, I came up empty handed. More surprisingly, after combing through the commission reports for the improvement of the island of Goeree (all of which deal with this problem of erosion) and the notes from the “Statenvergadering” where this issue may have been discussed, I find that I’m no closer to finding the smoking gun. Is this simply a dead end? Is this just another case of mistaken dates or incorrectly copied citations? 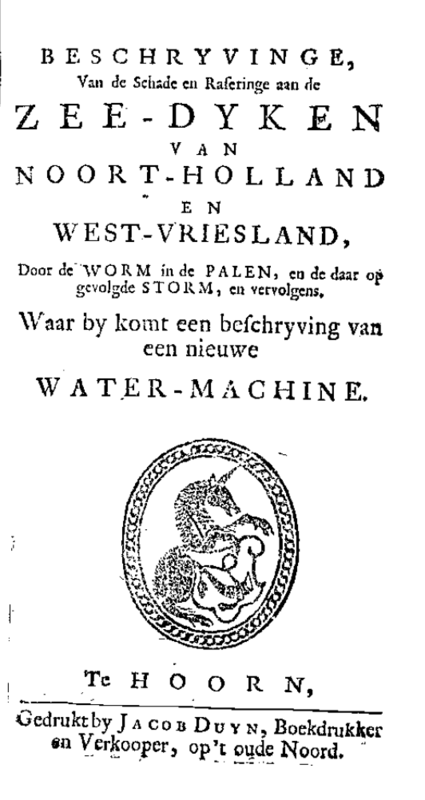 Bringing this back to Cruquius, it is significant (if still only a possibility until I find that elusive source) that this pivotal figure of Dutch water management should have found himself involved in a scenario that involved both shipworms and rivers (it can only happen in estuaries). While this series of posts will not focus on environmental connections, this is a rare (if rather indirect) relationship dependent upon environmental variables and mediated by technology (tidal and ocean dynamics necessitating a technological solution that opened up a new niche for an ecological invasion). Cruquius capitalized on this conjuncture and created one of the seminal cartographic works of the eighteenth century. Paul van der Brink, ‘In een opslag van het oog’: de Hollandse rivierkartografie en waterstaatzord in opkomst, 1725-1754 (Canaletto/Repro-Holland, 1998), 20. J. Hoving and A. De Kraker, “Cruquius’ aanpak van het Goereese Gat:De casus van de verzanding van het Goereese Gat en de veiligheid van Goeree getoetst tijdens de achttiende eeuw,” Tijdschrift voor waterstaatsgeschiedenis 22 (2013) 1, 57-68. Jeffrey A. Crooks, “Lag times and exotic species: The ecology and management of biological invasions in slow-motion.” Ecoscience 12, no. 3 (2005): 316-329. This entry was posted in Research on July 4, 2016 by ads135. 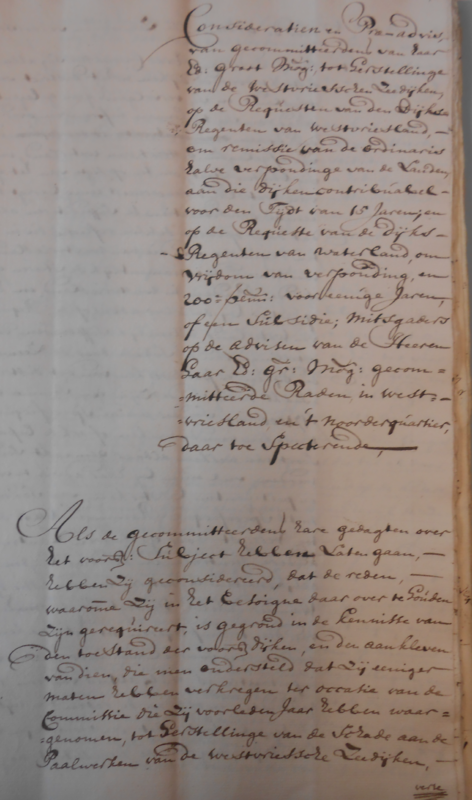 On the 8th of March in 1732, the Dijkgraaf (Dike Reeve) of Drechterland, Wijnant Nieuwstadt wrote a letter addressed to the University of Leiden. It appealed to the eminent natural philosopher and mathematician Willem Jacob ‘s Gravesande to help with “a terrible judgement from God” that had afflicted West Friesland. This “evil,” he stated, was “ruinous for all of the strongest dikes, piles, and krebbingen” in the region. The cause of his alarm was a “worm” that had “eaten through the piles of several West Frisian dikes, as well as those at Den Helder, Texel, and elsewhere.” This “worm” was in actuality a marine mollusk called Teredo navalis that bored into the wooden components of dikeworks across the maritime provinces. Shipworms were not new to the Netherlands in the 1730s, but they had never appeared so suddenly and with such destructive consequences. This was the first sustained, explosive outbreak of shipworms in the coastal water defenses of the North Sea. The disaster was an early modern media event that prompted dozens of newspaper articles, pamphlets, and books, not to mention hundreds of governmental decrees and resolutions addressing the subject. It generated international attention from enterprising engineers and scientists wanting to profit from the disaster, just as it prompted self-reflection from moralists criticizing the moral fabric of the Netherlands. Shipworms generated widespread interest, anxiety, even fear among contemporaries. The plague of Teredo navalis, in other words, was a mirror that reflected the cultural and environmental history of West Friesland and the Netherlands. The shipworm epidemic of the 1730s is not unstudied. It has generated sustained (if relatively minor) interest from scientists and historians since the eighteenth century. Despite its broad significance, however, much of the recent historical research on this period covers its economic and technological consequences. This is perhaps unsurprising. The economic consequences of the outbreak were considerable. 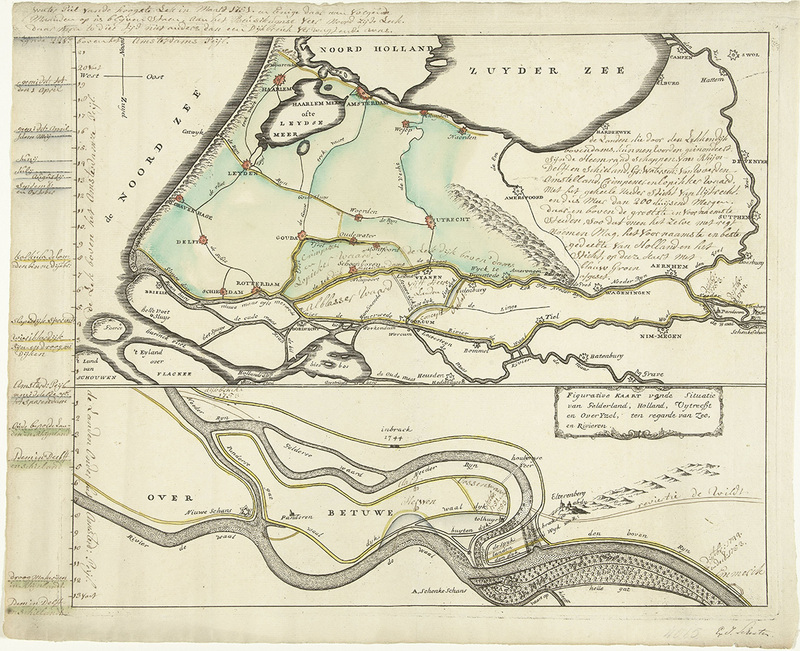 Between 1732 and 1743, waterschappen across the Netherlands were forced to expend an estimated 8.1 million florins to rebuild dikes and in in West Friesland alone, the total costs for dike improvements have been estimated at 4.8 million florins. 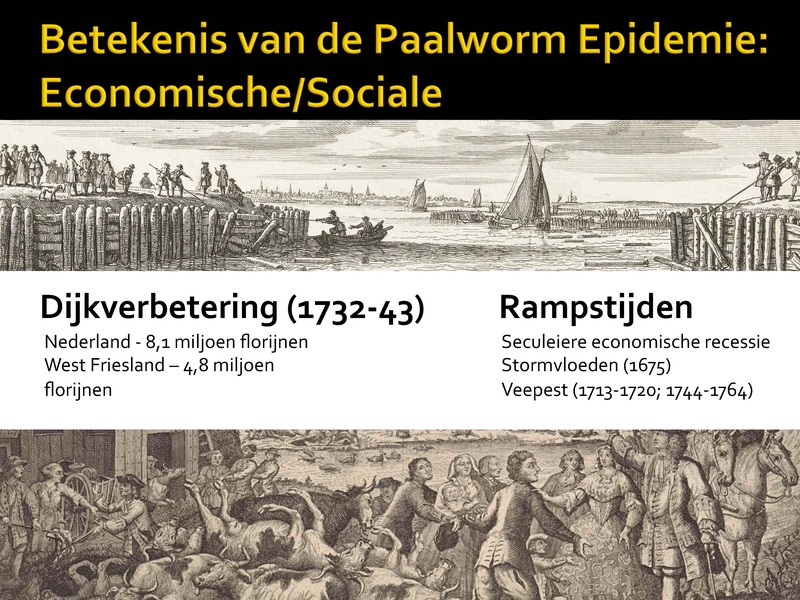 Arriving during an era of secular economic recession in West Friesland and sandwiched in between two deadly epidemics of cattle plague, the economic consequences of shipworm plague were onerous, even disastrous for some communities. From the perspective of the history of dike technology, shipworms were likewise influential. Dike designs varied, even within a single region like West Friesland, but many employed wooden components, either as wooden palisades or as supporting structures for large, wave breaking cushions. Naturally, shipworm appetites made these designs problematic and water boards across the coastal Netherlands experimented with new dike designs and “remedies” intended to combat this molluscan plague. The extent and speed with which waterschappen implemented these “novel” designs varied, but in West Friesland we can state that the shipworm episode marked a significant breaking point where dike designs increasingly used stone as construction material, either by laying stone in front of the paalwerken and krebbingen (as in parts of West Friesland), or replacing wooden material entirely with gently sloping dikes layered in stone. In their brief exchange, Nieuwstadt and ‘s Gravesande only implicitly address the pressing economic and technological challenges of the shipworm epidemic, however. Regarding economic concerns, Nieuwstadt merely comments on the impo ssibility of accounting for the costs of dike repair. When asked for recommendations regarding possible technological remedies for the molluscan infestation, ‘s Gravesande’s replied with caution. He critiqued several possible solutions that had been forwarded to him including the application of a special poison to the wood. “I have no knowledge of anything,” he argued, “that can cleave so tightly to wood that after a few years under water and standing up against the beating of waves with remain.” Despite (or perhaps because of) his experience and reputation, he qualified his input. Although he “examined and sought insight into the subject in a limited capacity,” he replied, “I have to admit that I have little to offer toward the stopping of this evil…I have no research, and I’ve found nothing useful from books on the subject. 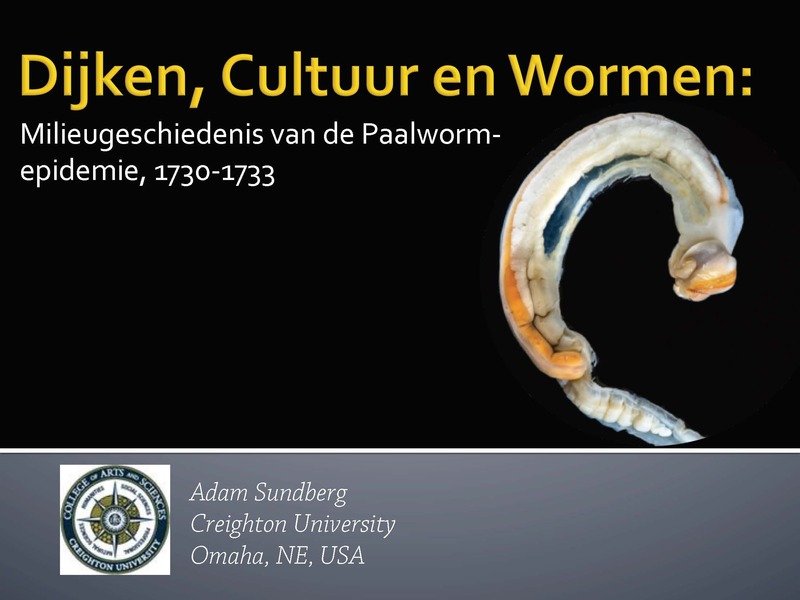 Instead, ‘s Gravesande commented on the similarities between the “North Sea” worm and other shipworms from the Americas, whether the epidemic would disappear on its own, and the animal’s natural and divine origins. What were the shipworms? Water authorities, natural historians, moralists, and laypeople each grappled with this most fundamental set of questions. Shipworms were not completely unknown to eighteenth century Dutchmen. European mariners, including the Dutch had had a long relationship with shipworms in foreign waters, particularly as their voyages took them into the tropics. There is even some limited evidence of wood borers in Dutch waters as early as the late sixteenth century. Little of this experience translated to a clear picture of habits, life history, or environmental limits of the mollusk. This was an important question, because it explicitly delineated the scope of Dutch vulnerability and the likely duration of the plague. Prior experience likewise offered only limited insight to a second major question: where did the shipworms come from? Were shipworms indigenous to Dutch waters? Did they simply explode in population because of some environmental influence? Or was it because of Dutch sin and God’s providential wrath? What if shipworms were foreign invaders? Were they unwelcome passengers on East or West Indiamen? This set of questions addressed more than the origins of the disaster, but its ultimate character. They determined whether the epidemic was natural or supernatural; whether this would be the first of several outbreaks; and whether adaptive measures had any chance of success. Both sets of questions were important because they explicitly framed the disaster as knowable and, therefore, potentially reversible. They laid the groundwork for what political scientist Deborah Stone terms, “causal stories,” or “images” of perception and interpretation that frame disaster response. Simply put, one cannot make changes after a disaster unless one understands what happened. In the context of West Frisian dikes, “causal stories” affected dike adaptation. 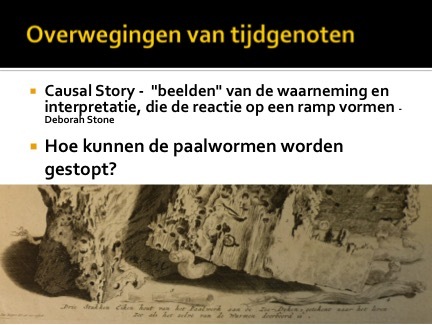 These “causal stories” fundamentally grounded a third set of questions: how could the shipworm be stopped? Should solutions focus on killing the mollusks? Should they focus on preventing infestation of the wood? Should the solution be chemical? Mechanical? Spiritual/moral? Should the solution draw upon historic dike designs or depend on innovations? Knowledge of what they shipworms were and where they came from (in other words, the foundations of causal stories), determined which solutions were acceptable. For the remainder of this talk, I want to outline how these questions were addressed in West Friesland. In doing so, we can develop a clearer picture of why water authorities chose the designs that they did. What were they shipworms? Today, we understand the naval shipworm to be a marine mollusk of the family Terenidae. Shipworms are highly specialized bivalves that consume and live in wood submerged in (to a large extent) coastal areas. They are worm-shaped and have two shells that are used as boring tools. T. navalis is very widely distributed today, from the Sea of Japan to the Swedish coast of the Baltic Sea. This is partly because T. navalis had relatively wide tolerance for environmental conditions. Despite this, temperature and salinity are its two most significant limiting factors. Reynvaan was the first to describe the shipworm in detail. He noted that the worms were “2,3,and 4 thumbs in length and a pipe stems thickness entirely of slime foulness.” He went on to note that they were found, not only in the hoofden, but also in the rijsstaken. By the end of the year, Reynvaan discovered that they did not discriminate between oak, birch, willow, or alder and that they infected green and older wood. All of these initial findings would be broadly disseminated across the Netherlands, including to West Friesland, where Nieuwstadt would then forward them to ‘s Gravesande. The West Frisian theater of the shipworm plague would begin under similar conditions in September of 1731. A wier and palen inspection discovered that strong northern winds and high water had knocked loose several piles along the Drechterlandse Noorderdijk. This was not unusual, however. It was only after rumors of “extraordinary sea worms” in the piles of Texel and Den Helder that the shipworm became a West Frisian disaster. Initial observations of the threat mirrored those in Zeeland. Observers described the worms’ length, their preference for pine wood, and their infestation up to the high tide mark. It is important to note that these initial observations served as a foundation for later attempts to determine the biology and environmental limits of the shipworm. Many of these early reports were collected in the periodical Europische Mercurius, which published a special “Bericht de plaage der Wormen in the Paalwerk der Dykagien van Holland en Zeeland.” This report drew on the very same dike reports coming out of Zeeland and West Friesland. Knowing what the shipworms were (and were not) was an important precondition to dike repair. This information was doubly important because “strange and outrageous rumors and false descriptions being spread in foreign countries.” One German newspaper reported that Amsterdam’s houses had begun to collapse when their foundations were eaten by worms. Another Swiss newspaper reported that the worms’ heads’ were as hard as iron, they could be two feet long, and the dug holes directly into the dike. Reports like the Europische Mercurius were important because they drew on firsthand observations by dike officials. These early questions about what the shipworms were explicitly framed that problem as an engineering problem, albeit one with no clear solutions. Empirical observations confirmed the species was marine (and could not live in fresh water), that it preferred green wood, but would embed itself in almost any native European wood up to the high tide mark, as well as the seasonality of the outbreak. These were important observations because they determined the scale of vulnerability of West Frisian dikes. Following the 1731 inspection of the Vier Noorder Koggen dikes, the only areas that were not infected were those that dried on a daily basis. These reports also gave observers no reason to believe the shipworm infestation would end on its own. In his reply to Nieuwstadt, ‘s Gravesande noted with “groot leet,” “dat ik geloven weeten dat men sigh sonder rede vleyt dat dese plaag zal komen te cesseeren…het is wel apparent dat de schade onvergelykelyk grooter zal syn als tot noch toe is begroot.” A remedy needed to be found, but what kind would be effective? Where did the shipworms come from? The initial response to shipworms was the search for a mechanical remedy, but by 1732 the realm of available solutions had widened considerably. This was largely due to the widespread popular response to the call for solutions. Remedies, however, came in many different forms. Poisons, smeersels, iron buttresses, and new designs for dikes arrived from across Europe. As news of the disaster spread, spiritual solutions became more popular. Finally, the shipworm epidemic sparked a minor outpouring of scientific literature on the subject. 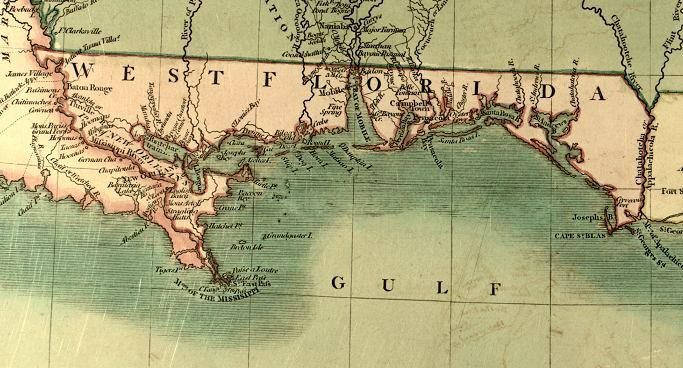 Between 1732 and 1735, the shipworm epidemic became a truly public, national disaster. In addition to describing the shipworms, these popular discourses addressed a second critical question: where did the shipworms come from? The question of the shipworms’ origins was a necessary component of a causal story. From the perspective of modern scientists, shipworms are still somewhat a mystery. They are considered a “cryptogenic species”; they have no known origin. The earliest accounts of shipworms in European waters date to the 4th century B.C., though it is impossible to determine whether this was T. navalis. Dutch mariners certainly came into contact with shipworms on a consistent basis after the expansion of Dutch trade into the tropics in the late 16th and 17th centuries. Dutch shipbuilders already considered T. navalis the principle hazard of tropical commerce by the early 17th century. Almost every VOC ship bound for Asia had shipworm “verdubbelen” – a triple layer of oaken hull, a layer of lead or hair nailed to the oak, and a soft pine wood over that. The shipworm epidemic also catalyzed intense scientific interest. Between 1733-35, a number of Dutch and international scholars contributed their insights into the origin and biology of the shipworms. Many recognized that this was a prime opportunity to produce meaningful, very public work. Jean Rousset de Missy, for instance, noted that “The Damage, which hath been caus’d by certain Sea – Worms, to the Pile-Works of the Dykes of Zealand, North -Holland Friesland, and the Coast of Flanders, hath made so much Noise, that it is no Wonder the Curiosity of the Publick, and particularly of Gentlemen who employ themselves in the Study of Natural Philosophy, hath been awaken’d to look narrowly into this Phenomenon.” Perhaps the most famous contribution came from the Prussian natural historian Gottfried Sellius, whose observations would later serve as the basis for Linnaeus’ taxonomy of the species. Although much information was shared (or copied) between the authors, their conclusions could be widely varied. In his 1735 treatise on the shipworm, Abraham de Bruyn, listed eight different theories as to the origin of the shipworm, from “they came from the east or west indies,” “they came from heat and siltiness of the North Sea,” to “they developed out of oyster banks.” Authors differed in their conclusions about the role of sea temperature, salinity, and the means of reproduction. 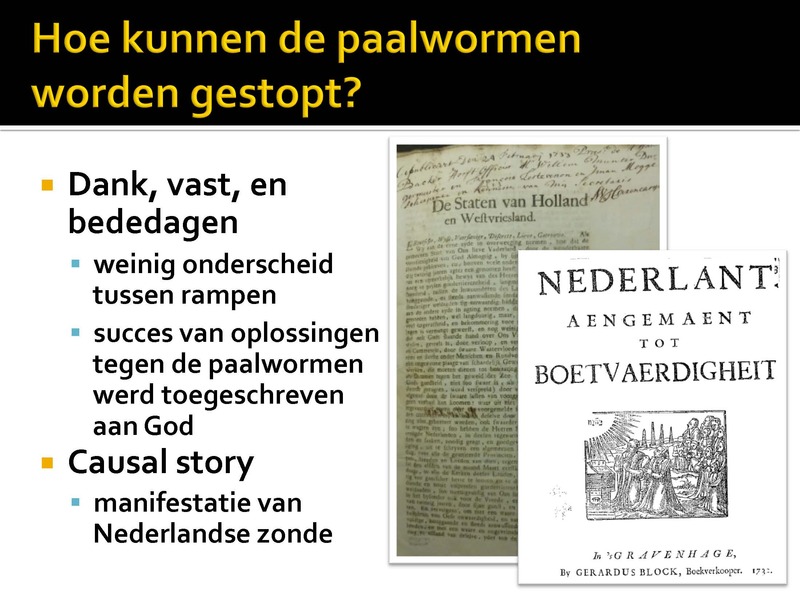 What De Bruyn, Belkmeer, Bommenee, and Reynvaan could agree on (and this was broadly felt in West-Friesland after 1731 as well), was that the ultimate origin of the shipworm plague was God. By far the most common explanation for the arrival of the shipworms was God. 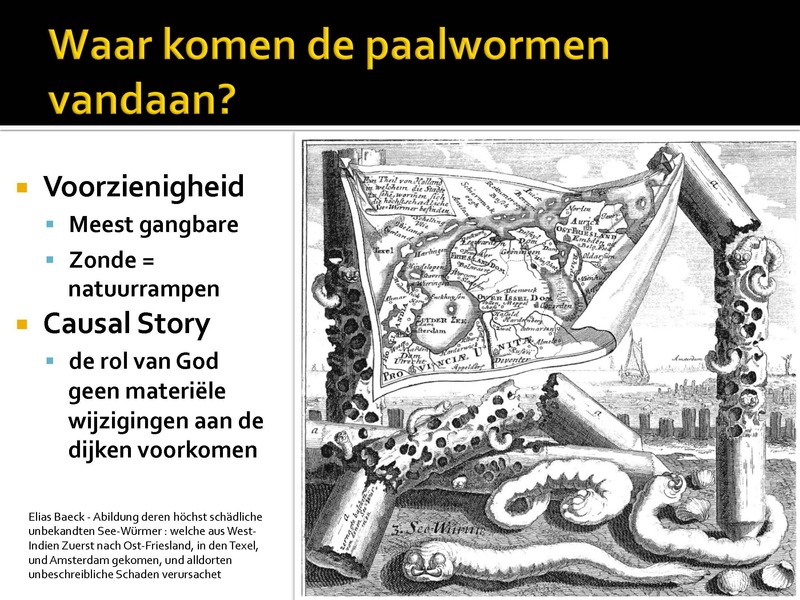 Shipworms were a judgment from God for the sinful state of the Netherlands. It is easy to dismiss this discourse as formulaic. Divine judgment, after all, was not an explanation for disasters specific to the eighteenth century. Several conditions about the shipworm epidemic appealed more strongly than to the role of God other disasters. First, it’s timing could not have been less ideal. By the early eighteenth century, much of the coastal Netherlands was undergoing a secular economic recession. West Friesland was particularly hard hit. A number of provinicial governments, as well as the Staten Generaal declared “Dank, Vast, and Bededagen” to ask God to end this era of disaster. The Staten van Holland en Westvriesland, for instance, called on all of the United Provinces to observe a day of repentance on the 11 of May, 1733 because of the “vermindering van Navigatie en Commercie, door swaare Waatervloeden, door ongemeene siektends en starfte onder Menschen en Rundvee, en nu laatstelijk door een ongewoone plaage van schaadelijk Gewormte in Paalen en Houtwerken.” Only a decade earlier, the first of three epidemics of cattle plague (likely rinderpest) had swept across the Netherlands, decimating herds and memories of previous disasters, including the flood 1675 had not yet faded. In this climate of dearth and disaster, the shipworms arrival signaled a renewal of hard times and further confirmation of God’s role. It is likewise easy to dismiss this discourse as the superstitious paranoia of early modern societies. The shipworm was strange, however. Common on voyages to the tropics, shipworms were largely unknown in the Netherlands. The scale and severity of the 1730 outbreak was absolutely unheard of. With no prior experience and no proven explanation of natural origin, divine explanations were a logical conclusion. As part of a “causal story,” divine judgment could work with naturalistic explanations or against them. For instance, although Reynvaan, Bommenee, and De Bruyn all subscribed to naturalistic explanations for the sudden appearance of the shipworms (mostly due to climate changes), all attributed the shipworms ultimately to God. As a causal element of the shipworm epidemic, God’s role did not preclude material changes to dikes. Naturally, an exclusive form of providentialism would not fit the causal stories of dike officials like Reynvaan or Bommenee or wetenschappers advertising remedies for the shipworm epidemic like De Bruyn. Many commentators during the eighteenth century had less interest in dike repair, however. Dutch morality in their view also required saving. A wave of providentialist books and pamphlets appeared between 1732 and 1735 warning of “Gods slaande hand over Nederland.” The shipworms, according to many pamphlets, were more than a sign of God’s displeasure; they were a sign of more terrible disasters in the future. Friesland’s 1732 plakkat for a Dank, Vast, en Bededag echoed much of the early confusion and frustrations of the waterschappen. The shipworms, it stated, are “Voorwaar een vreeslyk Oordeel Gods alhier nooyt bespeurt, waar af de oorspronk nog de voorteelinge, de kragt nog de sterkte tot nog toe door geen Menschelyk vernuft of schranderheyd kan gepeylt of nagespeurt werden, veel min eenige Remedie uytgevonden om de Goddelyke Plage af te wenden.” In this causal story, the fact that shipworms evade explanation and remedy is justification of their divine origins and a divine solution. Between 1732 and 1735, Dutch commentary on shipworms dramatically expanded. Water management officials remained actively involved, but new participants like natuurwetenschappers, moralists, and the broader public offered different interpretations of what the shipworms were and where they came from. These interpretations formed the basis for “causal stories” that turned a confusing, dangerous situation, into a problem that could be solved. How could the shipworms be stopped? Water boards’ primary challenge in the initial period of the outbreak had been its novelty. By 1733, new information and an expanded public discourse created a number of different options for dike authorities tasked with rebuilding West Frisian dikes. Moralists who held exclusive providentialist views, presented spiritual solutions like public prayers, penitence, and remembrance. Wetenschappers offered solutions that drew on their empirical observations of the biology and ecology of the mollusk. The wealth of proposals sent to West Friesland and The Hague at the request of the waterschappen tended to favor innovative and (supposedly) exclusive remedies. The waterschappen were publically open to new designs and conducted extensive tests of many. Causal stories framed each of these realms of action. In the end, they favored a capital-intensive solution based on established dike designs. This solution adhered to a causal story grounded in new knowledge of shipworms, but one that ultimately turned shipworms into flood risks. The response from waterschappen began immediately, but reports were often couched in tentative language. A letter from Edualdus Reynvaan, for instance, noted that “little can be said with certainty” about how to remove the mollusks. In general, waterschapsbestuur remedies can be roughly divided into two realms: 1. Rebuilding dikes with little alteration 2. Relying on maritime experience with the shipworms. The initial response was simply to repair with some minor alterations. Later, inspectors from a commission established by the Staten van Holland presented a “nieuw manier van dijkagie” whereby the krebbingen that had held the wier in place would be removed. Instead, piles would be perpendicularly driven through the wier to fasten it to the sea floor. This method proved both expensive and susceptible to damage by waves. At the same time, the Holland commission was testing a variety of proposals from near and far. Many remedies drew, to a large extent, on the measures taken to protect ships. 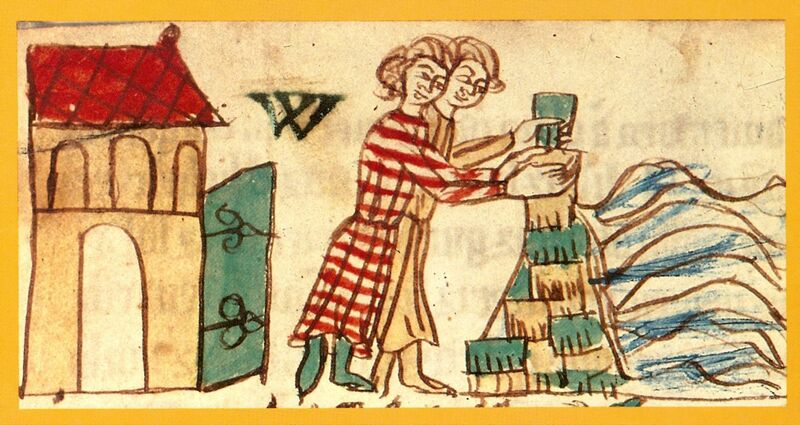 Reynvaan noted their experiments with the piles. They burned the outside of the piles, coated them with tar, harpuis, and hair, and noted their effectiveness. They also noted their unworkable costs. Maritime experience with shipworms was useful, it seems, but it was not workable on the scale of Dutch coastal defenses. In response, they turned to outside information. Indeed, the vast majority of solutions available to the waterschappen of West Friesland came from outside their institutional organizations. Suggestions came from as far afield as Switzerland, France, and Italy. Many of these remedies were tested in West Friesland and the majority were variations on the maritime solutions tested in 1732. One of the more interesting solutions drew on a different maritime strategy to protect ships, this time by cladding the outside of dikes in large, flat copper wormspijkers. Records from England date this technique with lead to as early as the 17th century, and possibly as early as the ancient Phoenicians. Versions of this remedy were tested in Zeeland and West Friesland. In Drechterland in 1733, test piles with copper cladding were found to be the only piles that were not infected, but because of their great expense, “no award for this test can be given.” While this method was too expensive to be employed on every dike, they were used to protect areas with little to no land in front of dikes, such as harbors or sluices. In sum, the initial response on the part of waterschappen was to focus on the mollusks themselves. From the perspective of causation, animals were the source of their problems. Their solutions focused on those animals and drew on centuries of received wisdom from mariners. Dikes were not ships, however. Years of testing based on maritime knowledge of the worms reinforced the effectiveness of their methods, but proved impossible to employ on such as large scale. A different solution was needed. A second set of solutions came from wetenschappers. They saw the vacuum of information available to waterschappen as an opportunity. Cornelis Belkmeer addressed his treatise to the commission established by the Staten van Holland to inspect the West Frisian dikes. Indeed, the majority of the natural historical treatises produced about shipworms between 1733-1735 self-consciously advertised the practical benefits of th e “new” knowledge they produced. Unlike other participants, these authors tended to promote solutions that drew on their new findings. For instance, a source of debate amongst authors was the reproduction of shipworms. Many authors observed a white slime on the outside of the piles and concluded it contained shipworm eggs. As a result, Belkmeer suggested burning the outsides of the piles to harden them and then scraping the slime with “yzere schrapers en styve borstels.” Although none of their solutions were accepted, a few were considered. The commission for the repair of the West Frisian sea dikes estimated the cost of Rousset’s remedy at 1.36 million guilders, but left no record of its success or failure. Like the early proposals and experiments conducted by the waterschappen, the wetenschappers largely interpreted the cause of the disaster to the shipworms themselves. Unlike the waterschappen, however, they typically sought a deeper level of causation. They sought new information about the biology and origins of the shipworm that might offer insight to potential remedies. A third set of potential solutions was spiritual. Dank, vast, and bededagen were the core remedies, though many providential texts also recommended more comprehensive individual spiritual renewal as well. According to the “sin economy” of divine providence, Dutch sin directly translated to natural disasters. This causal framework made little distinction between “kinds” of natural disasters. Veepest, overstromingen, fires, and shipworms all required the same solution. In fact, the strangeness and unprecedented nature of the shipworm th reat was ideally suited to providentialist interpretation. Providential remedies were likewise flexible. While a few exceptional moralists fatalistically warned that attempting to remove the shipworms would only bring more terrible punishments, most easily mingled with secular solutions. Indeed, the success or inventiveness of remedies against the shipworms was also often attributed to God. Henricus Engelhardt, for instance, attributed his “goede sufficante middellen” to his “groote zorgvuldigheid en smekinge tot God.” Providential remedies were not insignificant. Unlike many of secular plans or remedies, spiritual solutions were invested with institutional authority from both church and state. The concurrent performance of spiritual and secular remedies speaks to confidence in both. A final set of potential solutions developed out of the exhaustion of other options. Although some had proved feasible, none fit the requirements of being impervious to shipworms, durable against the sea, and cost effective. The solution in West Friesland developed out of a reassessment of the nature of the disaster. 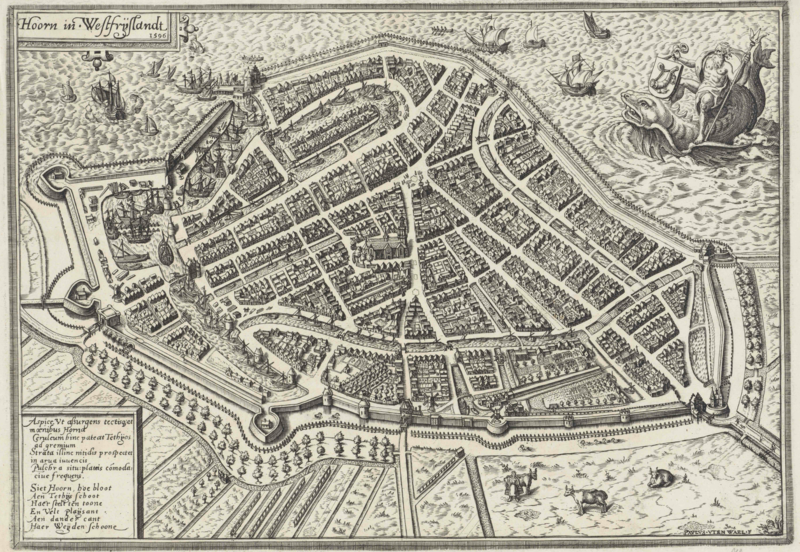 Why was Pieter Straat and Pieter van der Deure’s design so successful? Naturally, it helped that both were waterbestuurders in West Friesland. They promoted the innovative qualities of their designs. They called their proposal a “nieuwe manier van Dykagie” never before used, which “Kayen en Klipsteenen aan den Dyk te doen brengen, en dezelve Glooiewyze van de Dyk af Zeewaart in te leggen, het welk een onfeilbaar middel zoude zyn omme de Dyken tegen het woeden der Zee te beveiligen.” This is perhaps an overstatement. The use of stone on the seaward slopes of dikes date back to at least the 16th century from the journals of Adries Verlingh. Straat and van der Deure’s designs could likewise be considered modifications to existing dikes rather than a completely new design. Rather than removing the wier and palen completely, stone was gradually used to cover the outermost slopes of the most threatened dikes. More than than that, Straat and Van der Deure proposed a solution that drew on multiple levels of causation. It drew on providential (even existential) language, crediting God for their inventiveness and calling on God to protect the Netherlands. To a certain extent, they acknowledged the causal significance of the shipworm animals. Their design worked because shipworms could not infest wooden components hidden under layers of stone. Perhaps more important was the degree to which their design removed shipworms from the equation. Shipworms are almost an afterthought in their proposal. The same animals whose mysterious origins, spread, and existence had proved so problematic for waterbestuurders and terrifying for the broader public were largely ignored. Straat and van der Deure were successful because they shifted the causal story to familiar territory: flood vulnerability. Their designs would be beneficial regardless of the shipworms. Even if the “zeeworm geheel en al ophield, en nooit weder te voorschyn kwam,” they argued, the dikes would be left stronger and cheaper to maintain in the long term. The “grootste bekommering ontstaat in stormen en tempeesten, dat men niet kan ontdekken noch verzekert zyn.” They also advertised the proposal as a measure to prevent the loss of coastline, an ever present issue that had necessitated the creation of wierdijken in the first place. Shipworms had already catalyzed widespread public participation in water management, dike design, and the natural history of the mollusk. They inspired numerous designs, patents, and books promoting remedies and new ideas about the cause and solution to the epidemic. In the end, it was only when shipworms had been converted back to the familiar threat of inundation that a suitable remedy was accepted. By the mid-18th century, authorities like Nieuwstadt were increasingly calling on university faculty to consult on challenging water management dilemmas and this was not ‘s Gravesande’s first request. ‘S Gravesande was part of an increasingly influential circle of scientists at the University of Leiden (including Hermann van Boerhaave) that trained a new generation of hydro engineers and surveyors, many of whom were employed in Rijnland. Zeischka, Siger. Minerva in de polder: waterstaat en techniek in het hoogheemraadschap van Rijnland (1500-1856). Uitgeverij Verloren, 2007., 288. “een zwaar ordeel van godt…ruineus voor alle zwaarte dycken, met palen krebbingen” Nieuwstadt, Wijnant. “Brief van W. v[an ?] 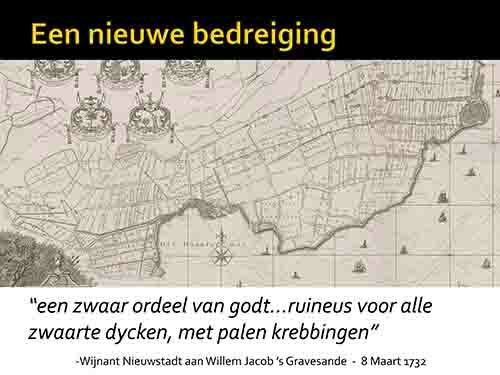 Nieuwstadt aan Willem Jacob ’s Gravesande (1688-1742) over het voorkomen van de paalworm in Noord-Holland. 8 Maart 1732. Met kopie van een brief uit Middelburg daarover, 9 Februari 1732 en de minuut van het antwoord van ’s-Gravesande.” Koninklijke Bibliotheek, n.d.
 “gewurmten, waar door de palen aen de westvriesse dycken, in aen den Helder, Texel, in elders meer werden doorgegeten” Nieuwstadt, Wijnant. “Brief van W. v[an ?] Nieuwstadt aan Willem Jacob ’s Gravesande (1688-1742) over het voorkomen van de paalworm in Noord-Holland. 8 Maart 1732. Met kopie van een brief uit Middelburg daarover, 9 Februari 1732 en de minuut van het antwoord van ’s-Gravesande.” Koninklijke Bibliotheek, n.d.
 Baars calculates a total cost in Holland of 6.5 million florins between 1732-1743/ Baars, C. “Nabeschouwing over de Paalwormplaag van 1731-32 En de Gevolgen Daarvan.” Waterschapsbelangen 75 (1990): 507. “Ik hebben geen denckbeelt van ietswas dat soo vast aan het hout soude kleeven, dat het eenige jaaren onder water daar op soude blyven, en het slaan van de zee tegen staen.” Nieuwstadt, Wijnant. “Brief van W. v[an ?] Nieuwstadt aan Willem Jacob ’s Gravesande (1688-1742) over het voorkomen van de paalworm in Noord-Holland. 8 Maart 1732. Met kopie van een brief uit Middelburg daarover, 9 Februari 1732 en de minuut van het antwoord van ’s-Gravesande.” Koninklijke Bibliotheek, n.d.
 “saak naar mijne geringe capaciteeyt geexamineert, en overal licht gezocht, doch weynig occasie daar toe gevonden buyten de papieren bij UW Edele missive ge[rigten] en ik moet tot mijn [leeswesen seggen dat ik wijnig hebbe in te brengen tot sluyting van het kwaad, daar het nochtans aankomt, ik heb geen ondervinding relatief tot dese saak, en niets inde boeken gevonden dat mij inde dese kand te hulp komen.” Brief van W. v[an ?] Nieuwstadt aan Willem Jacob ‘s Gravesande (1688-1742) over het voorkomen van de paalworm in Noord-Holland. 8 Maart 1732. Met kopie van een brief uit Middelburg daarover, 9 Februari 1732 en de minuut van het antwoord van ’s-Gravesande. Stone, Deborah A. “Causal Stories and the Formation of Policy Agendas.” Political Science Quarterly 104, no. 2 (1989): 281–300. Kulikova, V. A., N. K. Kolotukhina, and V. A. Omelyanenko. “Pelagic Larvae of Bivalve Mollusks of Amursky Bay, Sea of Japan.” Russian Journal of Marine Biology 40, no. 5 (2014): 333–43; Appelqvist, Christin, Jon N. Havenhand, and Gunilla B. Toth. “Distribution and Abundance of Teredinid Recruits along the Swedish Coast – Are Shipworms Invading the Baltic Sea?” Journal of the Marine Biological Association of the United Kingdom 95, no. 04 (June 2015): 783–90. “meest al de Paalen niet zyn uyt de grondt maar gelycks en boven de grondt zyn Afgebrooken die anders Nogh meenige Jaaren Zoude goet zyn geweest zyn de Reeden is dat al de Paalen vol wormen zyn.” “Notulen van de Staten (en Gecommitteerden van de Breede Geërfden), 1511-1812.,” November 23, 1730. 3000.20. Zeeuws Archief. 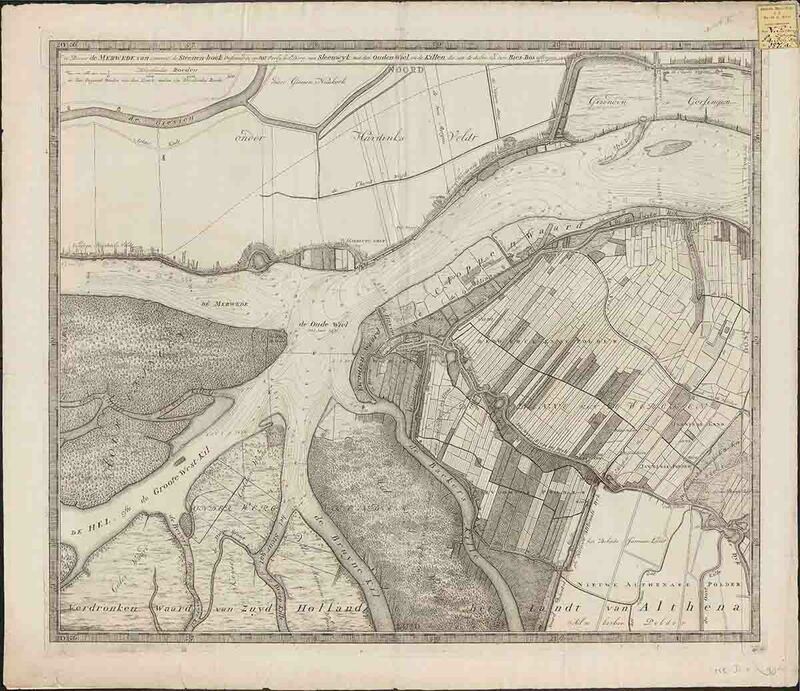 Geschiedenis der stad Hoorn, hoofdstad van West-Vriesland, gedurende het grootste gedeelte der XVII en XVIII eeuw, of vervolg op Velius Chronyk: Voortgezet tot op het jaar 1773. bij Gebr. Vermande, 1842., 243-44.
 anon. “Beschryvinge, van de Schade En Raseringe Aan de Zee-Dyken van Noort-Hollanden West-Vriesland, Door de Worm in de Palen, En de Daar Op Gevolgde Storm, En Vervolgens: Waar by Komt Een Beschryving van Een Nieuwe Water-Machine.” Hoorn, 1732. 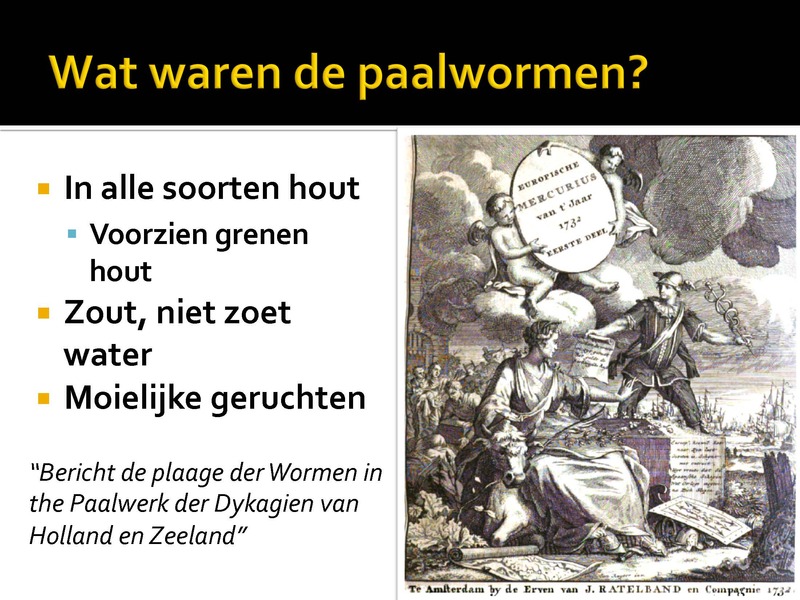 “Vervolg van Het Bericht Wegens de Plaage Der Wormen in Het Paalwerk Der Dykagien van Holland, Enz. Mitsgaders van Middelen Tot Stuiting van Dat Kwaad En Tot Verandering En Verbetering Der Dyken Voorgeslagen: Als Mede de Ontdekking van Dat Kwaad Op Andere Kusten.” Europische Mercurius 43.2, 307. Amsterdamse Courant, July 5, 1732. Gedeputeerden van Haarlem ter Dagvaart. Nationaal Archief. 3.01.09 1238. Baars, C. “De Paalwormfurie van 1731-1732 En de Schade Aan de West-Fries Zeedijk.” Waterschapsbelangen 73 (1988), 813. Nieuwstadt, Wijnant. “Brief van W. v[an ?] Nieuwstadt aan Willem Jacob ’s Gravesande (1688-1742) over het voorkomen van de paalworm in Noord-Holland. 8 Maart 1732. Met kopie van een brief uit Middelburg daarover, 9 Februari 1732 en de minuut van het antwoord van ’s-Gravesande.” Koninklijke Bibliotheek. Hoppe, K.N. “Teredo Navalis – The Cryptogenic Shipworm.” Invasive Aquatic Species of Europe; Distribution, Impacts, and Management, 2002, 116–19. Steinmayer, Alwin G., and Jean MacIntosh Turfa. “Effects of Shipworm on the Performance of Ancient Mediterranean Warships.” International Journal of Nautical Archaeology 25, no. 2 (May 1, 1996): 104–21. Parthesius, Robert. Dutch Ships in Tropical Waters : The Development of the Dutch East India Company (VOC) Shipping Network in Asia 1595-1660. Amsterdamse Gouden Eeuw Reeks. Amsterdam: Amsterdam University Press, 2010, 102-103. Wolff, Wim J. “Non-Indigenous Marine and Estuarine Species in The Netherlands.” Zool. Med. Leiden 9 (2005), 86. “Testament van Bommenee’, Register Houdende Bouw- En Waterbouwkundige Aantekeningen van Diverse Aard, Samengesteld Door Adriaan Bommenee,” n.d. Verzameling Handschriften Gemeentearchief Veere. Zeeuws Archief., 206. Reynvaan, Edualdus. “Missive Uit Zeeland over ’T Grasseeren Der Zeewormen Aldaar,” February 9, 1732. Ambacht van West-Friesland genaamd Drechterland en hoofdingelanden van West-Friesland. Westfries Archief. de Missy, Jean Rousset. Observations on the Sea- Or Pile-Worms Which Have Been Lately Discover’d to Have Made Great Ravages in the Pile-or Wood-Works on the Coast of Holland, &c: Containing A Particular Account of Their Make and Nature, and of the Use of Their Several Parts in Boreing and Feeding; with a Particular Description of Their Cells Or Lodgments in the Wood. London: J. Roberts, 1733. 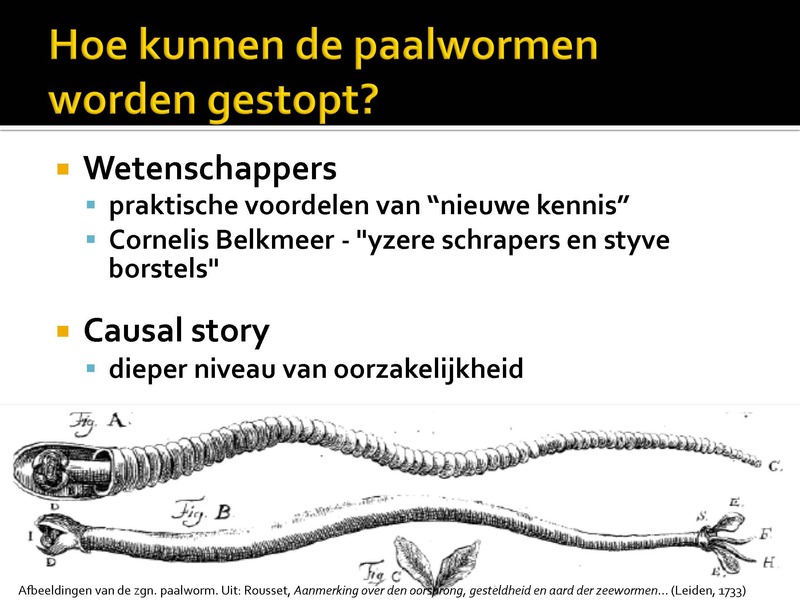 Abraham de Bruyn, Den Zeeworm beschouwd in zyn eigen aard en natuur … Mitsgaders een overweginge hoe, en wat voor middelen met vrugt en voordeel tegens dit verderf, en den zeeworm konden gebruikt worden, 1735, 52-62. “Plakkat (17 Feb),” 1733. Archief van de Burgemeesters. Stadsarchief Amsterdam. van Wyckel, J.S. “Placcaat. Uitschryving van Den Algemeenen Dank- Vast- En Beeden-Dag, Gehouden Binnen […] Vriesland, Op Woensdag Den 3. September 1732.” ’s Granvenhage, 1732, 5. Reynvaan, Edualdus. “Missive Uit Zeeland over ’T Grasseeren Der Zeewormen Aldaar,” February 9, 1732. Ambacht van West-Friesland genaamd Drechterland en hoofdingelanden van West-Friesland. Westfries Archief. Baars, C. “Nabeschouwing over de Paalwormplaag van 1731-32 En de Gevolgen Daarvan.” Waterschapsbelangen 75 (1990): 504; “Voorslaagen En Calculatien, Dienende Tot Een Plan, Hoedanig En Op Welke Manieren de Door Wormen Beschaadigde Zeedijken van Dregterland, Vier Noorder Coggen, Geestmer Ambagt, Schaager En Niedorper Coggen, Het Best Te Repareeren En Te Onderhouden Soude Zijn Tegen Het Geweld En Doorbraake Der Zee,” May 29, 1732. Archief van de Burgemeesters-Resoluties van de Staten van Holland. Stadsarchief Amsterdam. Baars, C. “Nabeschouwing over de Paalwormplaag van 1731-32 En de Gevolgen Daarvan.” Waterschapsbelangen 75 (1990), 504. Carlton, J. T., and J. Hodder. “Biogeography and Dispersal of Coastal Marine Organisms: Experimental Studies on a Replica of a 16th-Century Sailing Vessel.” Marine Biology 121, no. 4 (February 1995), 721-730; Woods Hole Oceanographic Institute. “The History of the Prevention of Fouling.” In Marine Fouling and Its Prevention. Annapolis, Maryland: United States Naval Institute, 1952. “Letter from Seger Lakenman to Monsr. Boekholt,” n.d. Slaan van proefpalen en beschouwingen van E. Reynvaan te Middelburg, J.H. 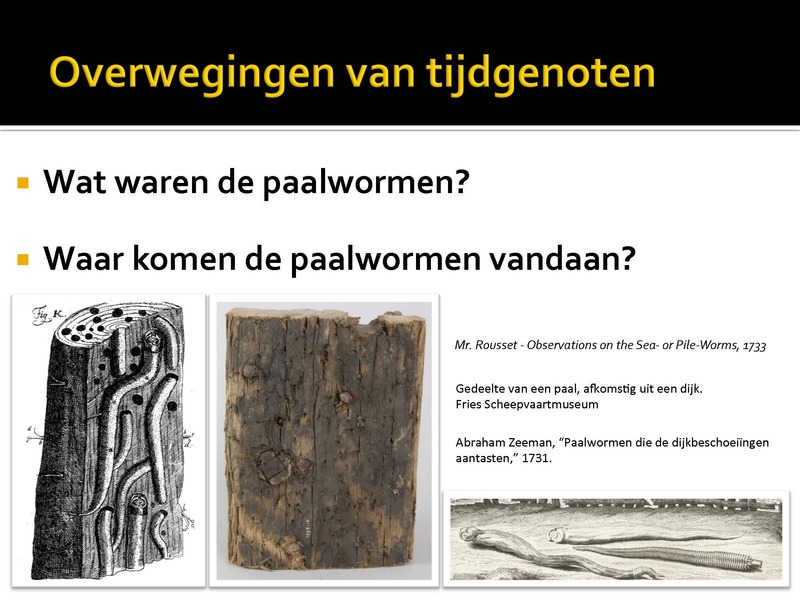 Eekholt te Groningen en J. Bushell over het optreden van de paalworm en manieren om hout tegen deze worm te beschermen, 1732-1734 en z.d. Westfries Archief. Bartels, Michiel H., Peter Swart, and H. de Weerd. “Wormspijkers in het Medemblikker havenhoofd Archeologisch en historisch onderzoek naar de maatregelen tegen de paalworm in het noordelijk havenhoofd van Medemblik, West-Friesland, NL.” West-Friese Archaeologische Rapporten 80 (2015). Belkmeer, Cornelis. “Naturkundige Verhandeling of Waarneminge, Betreffende Den Hout-Uytraspende En Doorbooren de Zee-Worm.” Amsterdam, 1733, 44. 28 Mar., 1733. Gedeputeerden van Haarlem ter Dagvaart. Nationaal Archief. 3.01.09 1238. Mobachius, Johannes A. De Almagtige En Regtveerdige Slaande Hand Gods, Ter Besoeking van Het Land En Deese Provincie Met de Verderfelyke Plage Der Zeewormen, Vertoond En Aangedrongen Uit Nahum I: Vs. 3; Op Den Plegtelyken Vast-En Bid-Dag, Gehouden in de Provincie van Groningen Ende Ommelanden, Den 8 Octob. 1732 …; Al Waar Met Een Ingevoegt Is Een Beschrijving van de Gedaante En Grootte Der Zeewormen, En Hoe Die de Dijkpalen Doorboren Nevens Een Afbeelding Daarvan. Groningen: Jurjen Spandaw, 1733, 49. Engelhardt, Henricus. “Goede Suffisante, Gods Verleende, Uitgevondene Middelen, Omme Yzere, En Steene Zeemuuren, Met Paalen Zonder Metzelwerk, Tegens Het Schadelyke Zeegewormte Te Maken, Dewelke in Plaats van Zeedyken, Dammen, En in de Zehavens Zoude Kunnen Dienen.” ’s Gravenhage, 1733, 3. Straat, P., and van der Deure. “Ontwerp Tot Een Minst Kostbaare Zeekerste En Schielykste Herstelling van de Zorgelyke Toestand Der Westfriesche Zeedyken… Met Een Nader Ontwerp Hoe Men de Dyken Daar de Grootste Dieptens Zyn Op de Zekerste, Minst Kostbaarste En Schielykste Wyze Kan Herstellen… Door Pieter Straat En Pieter Van Der Deure.” Amsterdam, 1733, 6. Straat, P., and van der Deure. “Ontwerp Tot Een Minst Kostbaare Zeekerste En Schielykste Herstelling van de Zorgelyke Toestand Der Westfriesche Zeedyken… Met Een Nader Ontwerp Hoe Men de Dyken Daar de Grootste Dieptens Zyn Op de Zekerste, Minst Kostbaarste En Schielykste Wyze Kan Herstellen… Door Pieter Straat En Pieter Van Der Deure.” Amsterdam, 1733, 19. Straat, P., and van der Deure. “Ontwerp Tot Een Minst Kostbaare Zeekerste En Schielykste Herstelling van de Zorgelyke Toestand Der Westfriesche Zeedyken… Met Een Nader Ontwerp Hoe Men de Dyken Daar de Grootste Dieptens Zyn Op de Zekerste, Minst Kostbaarste En Schielykste Wyze Kan Herstellen… Door Pieter Straat En Pieter Van Der Deure.” Amsterdam, 1733, 23. This entry was posted in Research on June 28, 2016 by ads135. Dikes, dams, and culverts. These were the themes of the recent conference sponsored by the Stichting voor de Middeleeuwse Archeologie (Association for Medieval Archaeology). The organizers laid out a short, one-day conference featuring recent archeological, historical, and geographic research on the subject of water management and water defense. Papers spanned a broad period of time, from Roman era dikes in Zeeland to ongoing efforts by the Rijksdienst voor Culturele Erfgoed (Institute for Cultural Heritage) to manage and protect dikes today and in the future. The Oosterkerk in Hoorn prepares for a day-long conference on Dutch dike history and archeology. 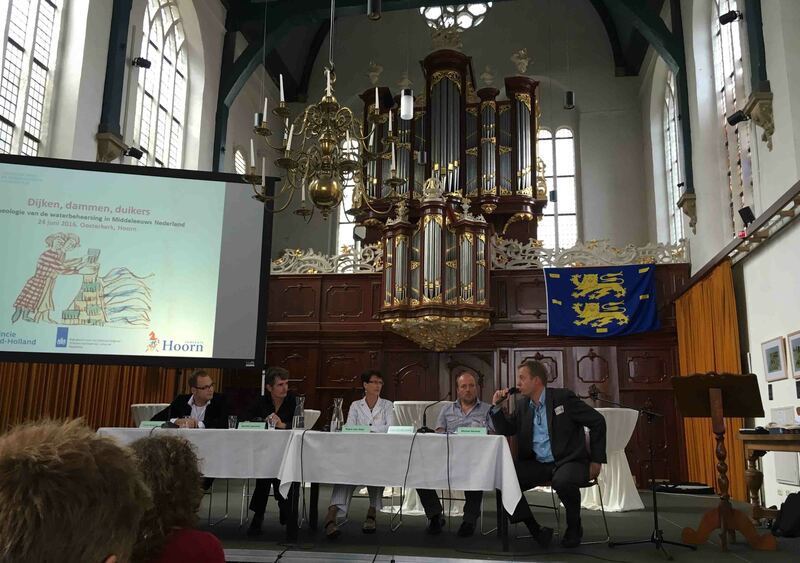 Hosted by Archeologie West-Friesland and MC-ed by the inimitable Michiel Bartels, the conference took place in the port town of Hoorn in Northern Holland. A former trade headquarters for the VOC (Dutch East India Trading Company), the city boasts a fantastic history and a well-preserved city center that hugs the west coast of the former Zuiderzee. Unlike many similar-sized cities in the Netherlands, Hoorn’s former wealth (generated during the 17th century Golden Age) remains on full display. The conference location, the impressive Oosterkerk, is evidence of this past. The conference itself showcased recent scholarship conducted on Dutch (and northern German) dikes. It also served as a sort of context for the publication of a new multi-volume book called Dwars door de Dijken (“Straight through the Dikes”). This book is a comprehensive account of recent research into West Frisian dikes and dike ecosystems (including both environmental ecosystems as well as the structures and landscape features that typically accompany coastal dikes such as sluices, dijkmagazijnen, voorland, etc.). 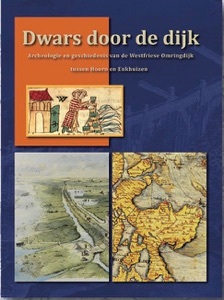 The book is an impressive interdisciplinary collection that documents over half a decade of research made possible through the cooperation of numerous parties, including the Stichting voor the Middeleeuwse Archeologie, Hoogheemraadschap Noorderkwartier, Stichting Archeologie West Friesland, and the municipality of Hoorn. The conference featured a wide variety of disciplines and specializations. Petra van Dam kicked off the event with a thoughtful consideration of the role of dikes and other adaptive measures that tended to limit flood fatalities in the middle ages. Working on themes framed by her work on the amfibische cultuur, Van Dam noted the importance of early warning systems, fleeing to high ground, and compartmentalization of the landscape to slow the advance of inundation. These cultural adaptations to flooding were key strategies, Van Dam maintained, that medieval inhabitants of coastal regions and floodplains used to mitigate disaster. One of the most compelling presentations was by Seger van der Brink. A geologist and maritime archeologist, Van der Brink presented the fascinating case of the “verdronken dijk van Texel.” Using sidescan sonar, an acoustic technique of visualizing the sea bottom, Van der Brink and his team discovered the remains of what appeared to be large rectilinear form under the Marsdiep approximately 600 meters from the shore of the North Holland island Texel. Van der Brink presented this case almost as if it were a detective story, beginning with the accidental discovery of the anomaly, followed by historical cartographic evidence (sadly no documentary evidence), finally revealing its identity as a dike constructed in 1749 and reinforced with stone (likely a result of the “petrification” of the Zuiderzee coastline due to the shipworm). The dike disappeared in 1792 as a result of the changing dynamics of the Marsdiep, though sadly, the story of the dike’s disappearance was not a central element of the talk. Nevertheless, the dike is the largest underwater find in the Netherlands and was an impressive showcase of recent work in maritime archeology. Luuk Koenen, from the independent archaeological firm RAAP spoke about recent excavations of a dike along the Waal River to the north of Nijmegen. Aside from research into the structure of the river dike, RAAP is also conducting historical-geographic information about landscape use and landownership using documentary data. 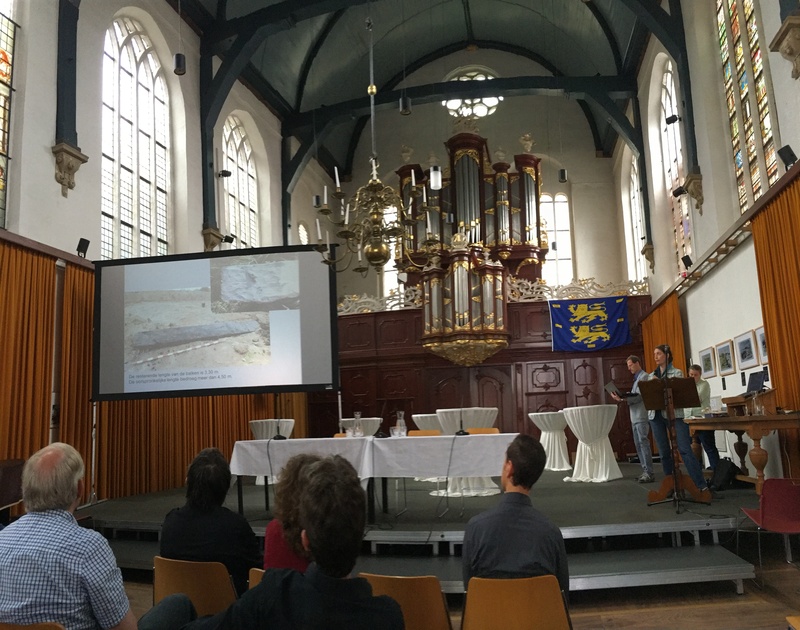 Sander Gerritsen presented a very animated and enjoyable talk about Archeology West Friesland’s excavation of the Klamdijk (the same dike I visited last year) and Robert van Dierendonck presented findings on three different ancient and medieval dikes in Zeeland. The keynote address was shared by three German archaeologists: Sonja König from the Ostfriesische Landschaft Archäologischer Dienst and Anette Siegmüller and Johannes Ey from the Niedersächsischen Instituts für historische Küstenforschung. Their presentation reconstructed the dike profile of a paaldijk near the Eems river close to the border of the Netherlands in the Dollard region. I had known that German and Dutch dikes often shared certain characteristics. Dikes are like extended families. Close relationships seem to follow geographic proximity, but (because of information networks) dikes in regions far from one another remain “cousins,” sharing notable features. Paaldijken are a case in point. Some coastal dikes in the Dollard region in German used long palisade-style wooden constructions to protect the earthen portion of the dikes from the force of waves. These were likewise employed in Friesland and the Zuiderzee region (now the IJsselmeer). König, Siegmüller, and Ey’s presentation laid out the historical development of this dike from a minor embankment to the modern construction one can visit today. 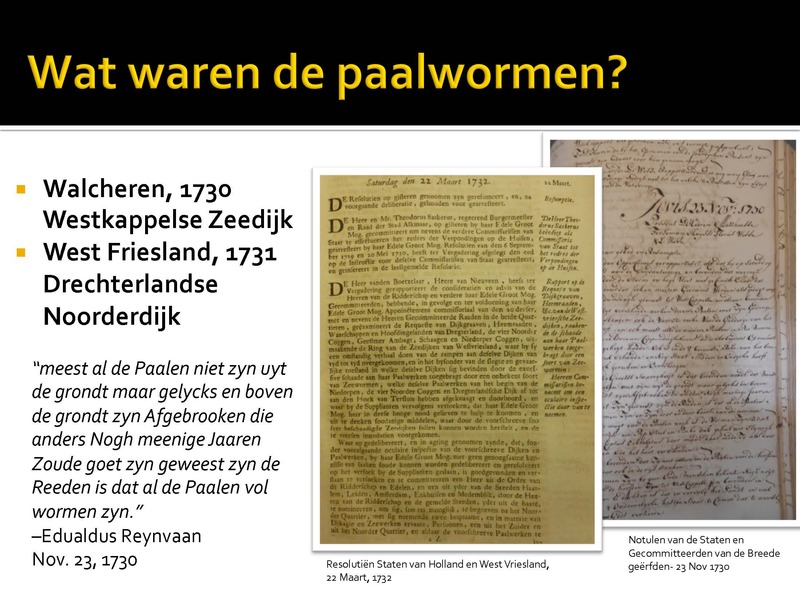 Two points were of particular consequence for me: first, that this paaldijk was not infected by shipworms. This is to be expected in an area bordering the Eems. Shipworms avoid areas with low salinity like the mouths of rivers. Shipworms did not make an appearance in Groningen (across the border in the Netherlands) until well after the initial outbreak in the 1730s. That said, they would eventually infest the Dollard region, even popping up near the town of Delfzijl. It would be interesting to determine whether similar paaldijken were constructed further from the Eems river, and thus more susceptible to infestation. damaged caused by the Weihnachtsflut and its subsequent repair. Contemporary German and Dutch sources often reference the use of ships to block the largest dike breaches and contemporary maps of the disaster actually show these ships on the maps themselves! Johann Baptiste Homann’s 1718 map of the Christmas Flood is perhaps the best-known example and it likewise depicts these iconic ships. To my knowledge, little scholarship exists on this fascinating source material. Although maps are often used in historical research (and apparently even MORE frequently in archaeology), disaster cartography, especially from the early modern period, is underdeveloped. This presentation provided further confirmation that more research into this subject is necessary. The second half of the conference tended to focus on the early modern and modern, rather than the medieval past. Menne Kosian of the Rijksdienst Cultureel Erfgoed gave a general overview of what he termed the “schizophrenic” relationship between the Dutch and water. 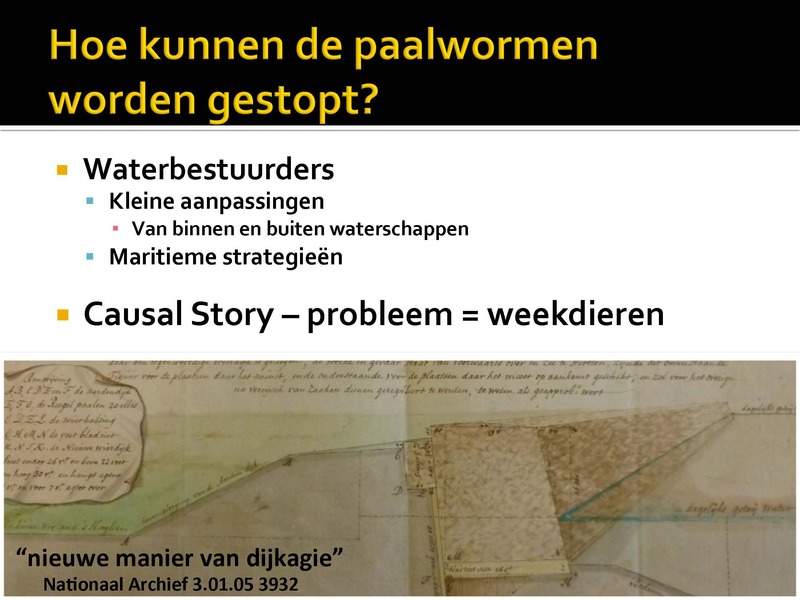 My own presentation covered the first phase of the shipworms epidemic between 1730-33 through the lens of “causal storytelling” (see blog for transcript) and Miranda de Wit of the engineering bureau MUG laid out her findings related to a 17th-18th century sluice in Drenthe. The final two presentations brought us into the modern period. The final two presentations were less historical or archaeological case studies, than “state of the field” talks. 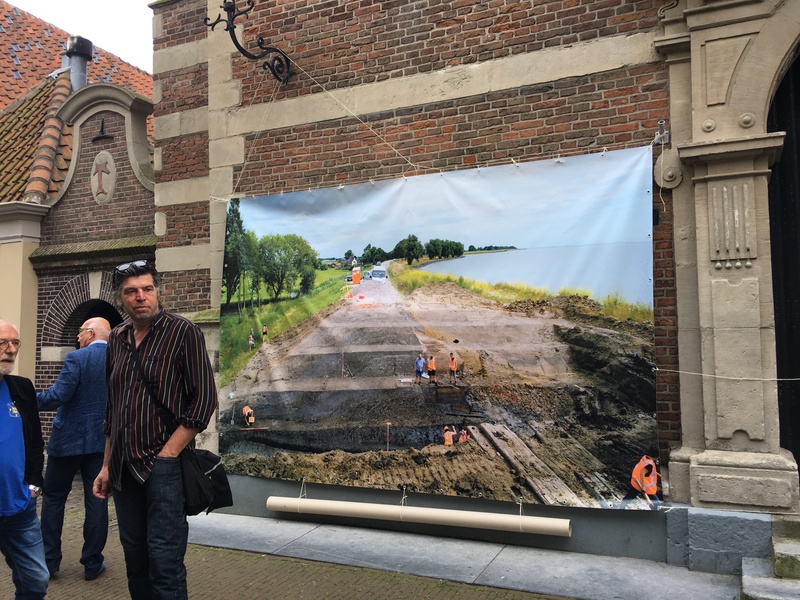 Michel Lascaris of the Rijksdienst Cultureel Erfgoed in Amersfoort and Michiel Bartels of Archeologie West-Friesland showed the audience the two faces of dikes as cultural heritage. On the one hand, dikes are living relics of the past. They reveal changing patterns of spatial development and settlement; they are artifacts of disasters and demographic changes; and they are material evidence of the historic relationship between humanity and the environment. Dikes, in other words, are archives. Dikes are also water protection, however. They are a necessary boundary between the sea and an (increasingly) vulnerable population. Lascaris and Bartels showcased the cultural value of dikes by highlighting their diversity and the special challenges cultural heritage and archaeological organizations face when attempting to use, explore, promote, and protect these unique structures. In the final panel presentation, which featured Van Dam, Bartels, Lascaris, Keunen, and Van den Brink, the audience was offered the opportunity to comment on some of the larger questions addressed over the course of the day (and some that weren’t). Of particular interest to me were Van Dam’s comments about the importance of storytelling in the context of dikes. Drawing a distinction between archeological and historical scholarship, Van Dam made the case for argument and narrative as compelling components of dike research. From my own perspective is seems clear that dikes are more than just the physical remnants of past settlement. Dikes tell stories. They can reveal tragedies and showcase hubris. The final panel takes questions from the audience. Today, the historical value of dikes tends to be ignored by the public. Few actively recognize their ongoing use as water defense, leaving the job of managing their vulnerability to elected officials and engineers. 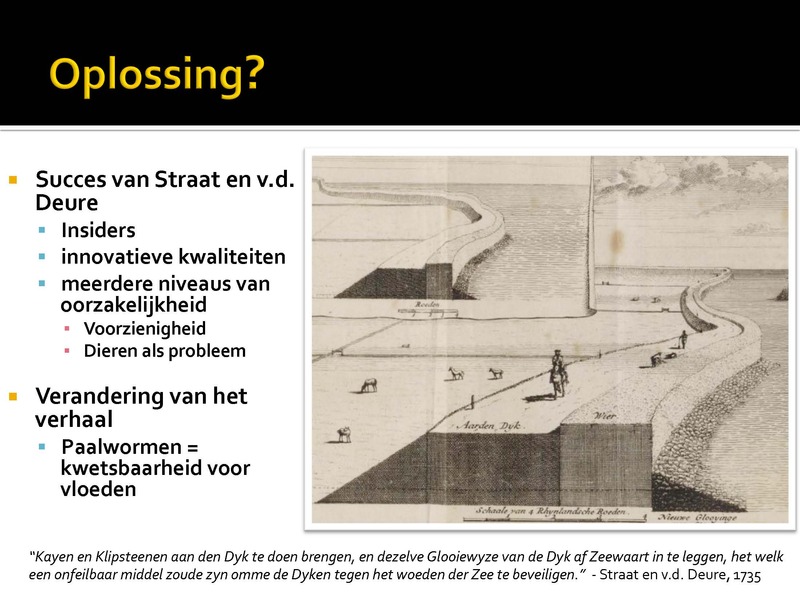 Landowners may consider them barriers or obstructions (thus necessitating the official protections that conserve historically significant dikes like the Westfries Omringdijk). Even people who regularly use dikes for roads or recreation are frequently unaware of the history of these structures. This is where archeology, history, and historical geography have their greatest opportunity. Last summer’s “open dike day” near Hoorn was very well attended by the public. Standing in the audience, people seemed to be fascinated by the process of discovery. They marveled at the depth of the excavation, and how the archaeologists pieced together the history of the structure with artifacts, historical documents and maps, and the guts of the dike itself. They were also interested, however, in the story of the dike. This included, of course, its historical story. The historical dispute that gave the Klamdijk its name, for instance, or its history of flooding and repair. Likewise, it also included the story of its future. Representatives of the local water board were on hand to discuss why a new pumping station (that opened up the possibility of excavating this protected space in the first place) was necessary in a climate changed future. The Open Dike day had cleverly married three stories: the story of the dikes past, the story of that history’s discovery, and the story of a potential future. Several of the presentations from Dijken, Dammen en Duikers likewise told stories. Grounded in evidence, they both engaged the public and inspired further questioning. Taken as a whole, the conference did so as well. The coda to this conference was the public unveiling of Dwars door de Dijk. My hope is that this work, like the conference it concluded, serves as a bridge between disciplines and between publics. Dikes appeal to a number of metaphors, and perhaps that blunt involve allusions to separateness, compartmentalization, and division. But as Roos van Oosten, the chairwoman of the Stichting Middeleeuwse Archeologie, also noted in her introductory remarks, dikes have in the past been the embodiment of cooperation and productive communal ambition. It was a fitting conclusion, I thought, that Van Oosten returned to this image and this same spirit (this time in the context of scholarship) at the closing of the conference. This entry was posted in Research on June 27, 2016 by ads135. Terug in Nederland! It’s been a little under a year, but I’m back in Holland. It’s been a little under a year, but the research blog is back. I was warned that teaching occupies a large share of one’s time as a first-year professor. Creighton (and the move to Omaha) offered a multitude of distractions, from service opportunities to student seminars, to conference presentations, to settling into a new city/new state. Happily, one of the products of last years research trip has finally seen the light of day. The research workshop “Resilience in disastrous times: the processing of historical catastrophes in the Low Countries (ca. 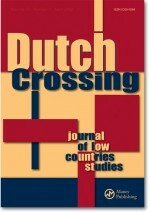 1600-1850)” resulted an edited volume in the interdisciplinary journal of Low Countries Studies, Dutch Crossing. The collection includes work from Raingard Esser on resilience to seventeenth century flooding and Marijke Meijer Drees’ contribution thoughtfully reconsiders the role of providential thinking (a particular fascination of mine) in the context of the Delft gunpowder explosion of 1654. Joop Koopmans and myself discuss shipworms. 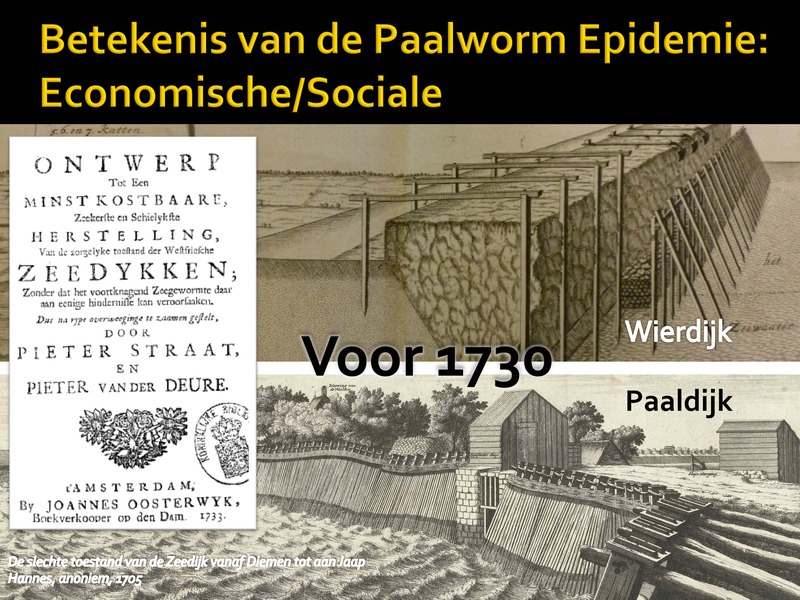 Koopmans considers the role of media (in particular newspapers, periodicals, and pamphlets) in the early years of the epidemic, and my own article addresses the paalwormepidemie in the context of disaster novelty. Finally, Lotte Jensen brings us in to the 19th century with her analysis of Louis Napoleon’s complicated relationship with his subjects, especially in the context of his management of disasters. Naturally, it’s nice to see a project completed to my satisfaction. The research into shipworms is far from over (stay tuned for more info on the subject), but I’m excited expand the work in new directions in the coming month. 2. Collecting cattle plague mortality data. This work relates to a collaborative research project independent of my manuscript with Filip van Roosbreuck. 3. 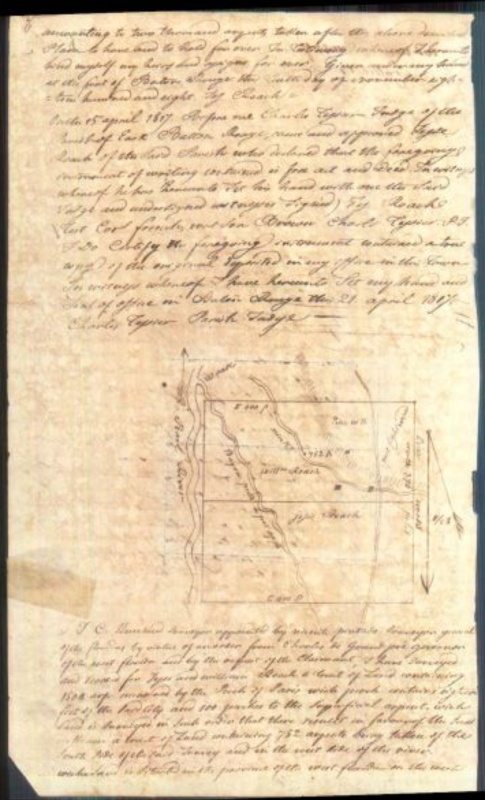 Collecting archival source material on the Dutch River floods of 1740-41. This final goal will dominate my time and will lay the foundation for a collaborative paper with Toon Bosch and (possibly) a final case study for my manuscript. One can’t work all the time, though! It’s the weekend and I’ve just finished a long standing project (more on that to come). I’m off to Gelderland for some lekker fietsen! This entry was posted in Research on June 25, 2016 by ads135. This entry was posted in DH Explorations on October 9, 2015 by ads135. This entry was posted in DH Explorations on August 31, 2015 by ads135.